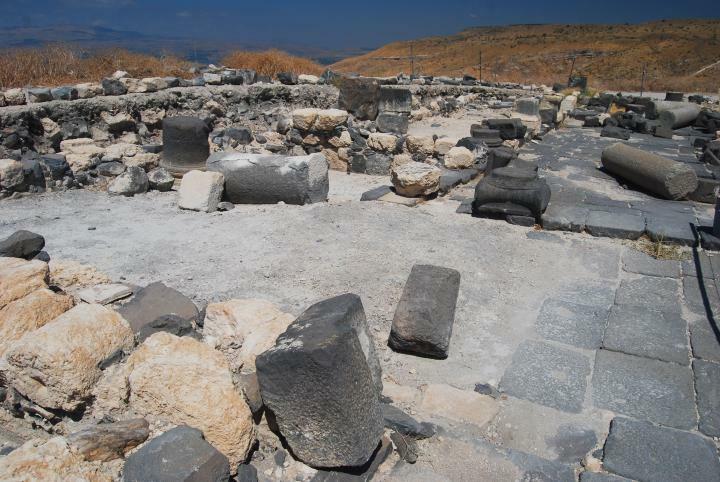 The ruins of an ancient city located on the plateau of a diamond shaped mountain by the eastern shores of the Sea of Galilee. The ruins of Hippos are of the Hellenistic, Roman, Byzantine and Umayyad periods. 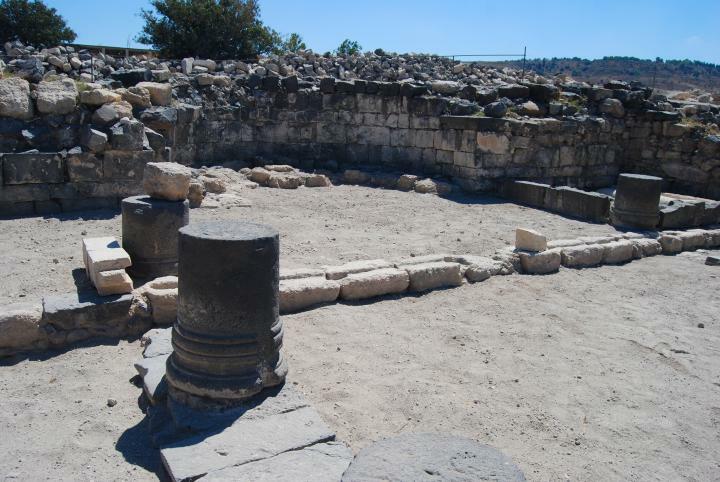 The site is one of the most remarkable archaeological sites in the North of Israel. 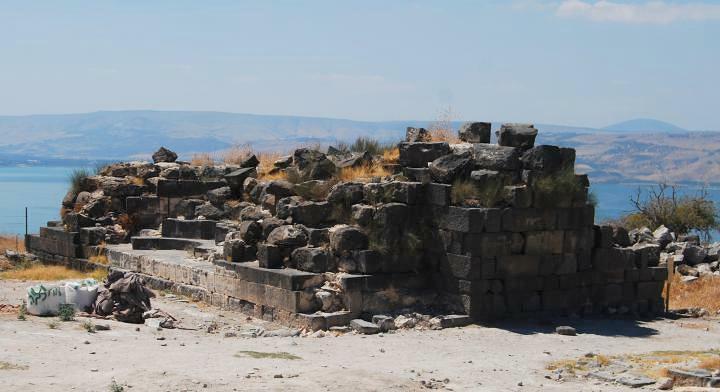 The city of Hippos (Sussita) was the central city of the Golan during the Hellenistic and Roman/Byzantine periods. 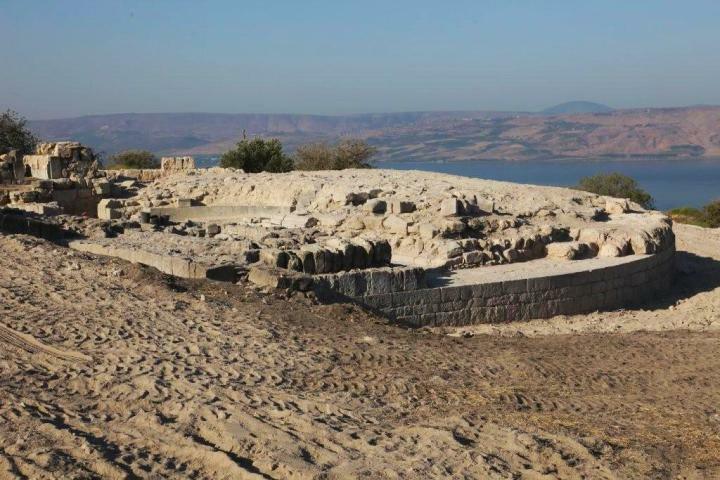 It is located on a diamond (or horse) shaped mountain which rises 350M above the Sea of Galilee. 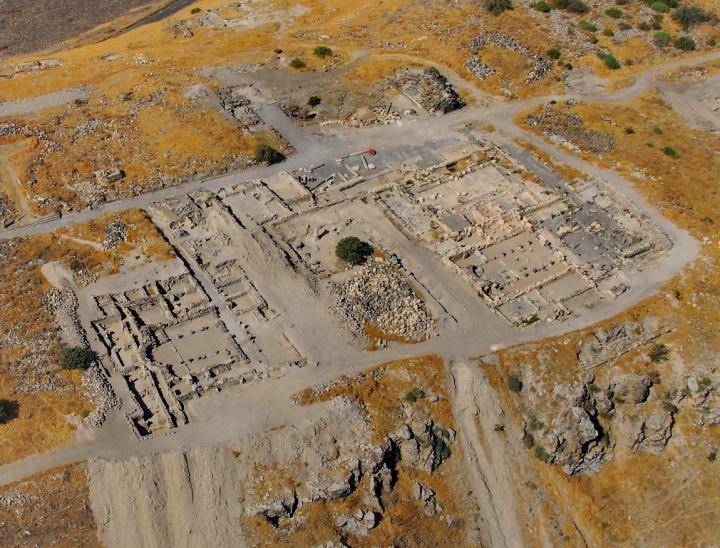 Recent excavations revealed the impressive plan and structures of the city. During the Byzantine period there were eight churches, indicating its importance for Christians. 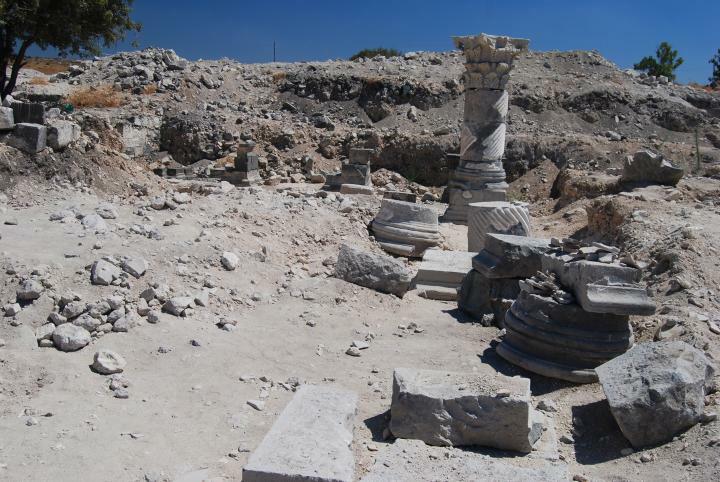 The city was devastated by a massive earthquake in 749 AD which left it in ruins since then. The ruins of Hippos are located on the east shore of the Sea Of Galilee, on a steep mountain, east of Kibbutz Ein-Gev. It is on the same latitude of the Roman Tiberias, which is on the other side of the lake and departed by 10KM. 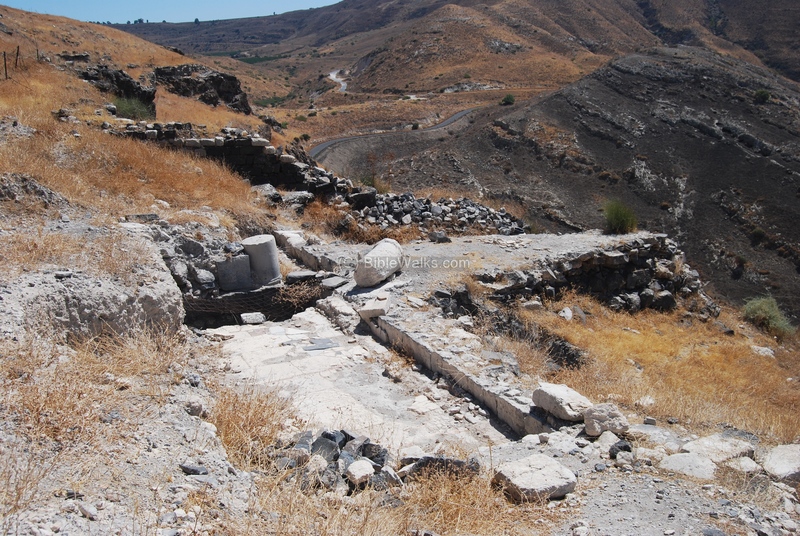 A damaged asphalt road leads up from Ein-Gev, or down from Afik in the Golan heights, reaching a parking place on its east side. The road is actually closed for driving except for use by farmers, although many cars use it as access to the Golan. The road remains the main problem of developing the site, and we hope that in the near future this road will be repaired. An aerial map of the area around Hippos/Sussita is seen below, indicating the major sites. You can point on the purple points to navigate to the selected point. The city is located on a high flat rock, shaped like a diamond or a horse's back (hence its name). The ancient city, 650m by 170m at its maximum sides, is surrounded by a wall which stretches along the rim of the rock. It has two gates - an eastern gate and a western gate. The major road, Decumanus Maximus (Roman east-west main street), traverses the city from east to west. The highest side is on the east (altitude of 144M, or 350M above the lake of Sea of Galilee which is at -210M). The rock slopes towards the western side (altitude 70M, or 280M above the lake). The major sites of the excavated city are seen in the following diagram. You can point and click on a purple point to navigate to its selected description. 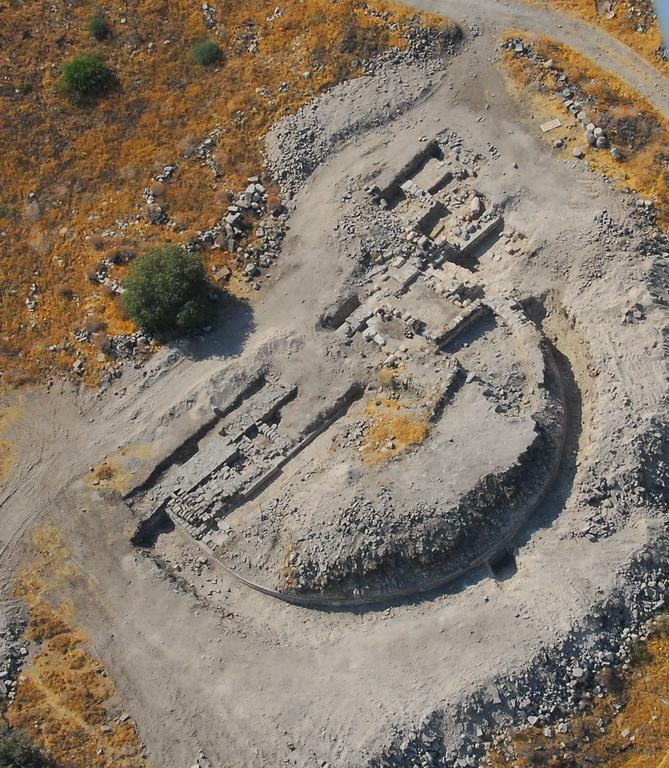 Several Bronze and Iron age sites were excavated around Ein-Gev, at the foothills of Hippos-Sussita. According to the findings, Early man lived in this area for at least the past 17,000 years. 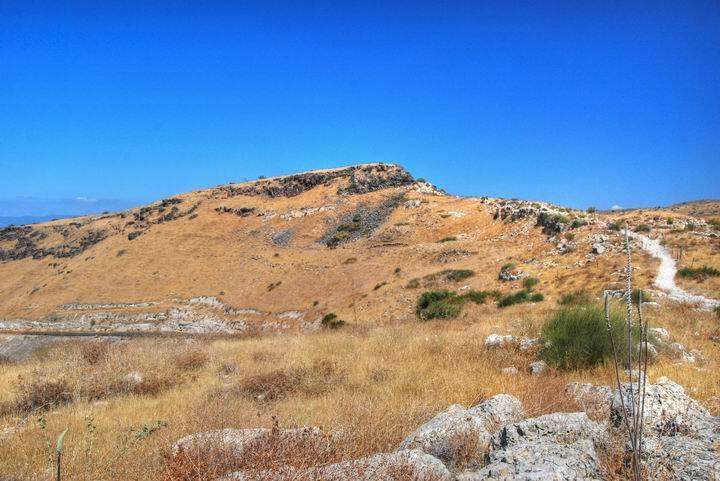 A Biblical city was located on the shores of present Ein-Gev, below the mountain of Hippos, in a 30 Dunam (3 Hectares) hill called Tell Ein-Gev. 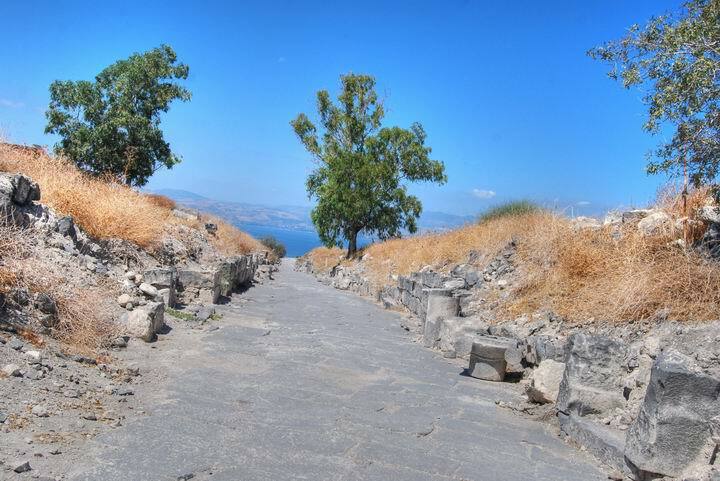 It was established in the 10C BC as a fortified Israelite city, had a fishing port, and protected the mountain passage which used the narrow valley north of Hippos as one of the trade roads up to the Golan. The Israelite city was destroyed in 732BC by the Assyrian King Tiglath-Pileser III, who annexed the area (as per 2 Kings 15: 29: "In the days of Pekah king of Israel came Tiglathpileser king of Assyria, and took ... Galilee...and carried them captive to Assyria"). 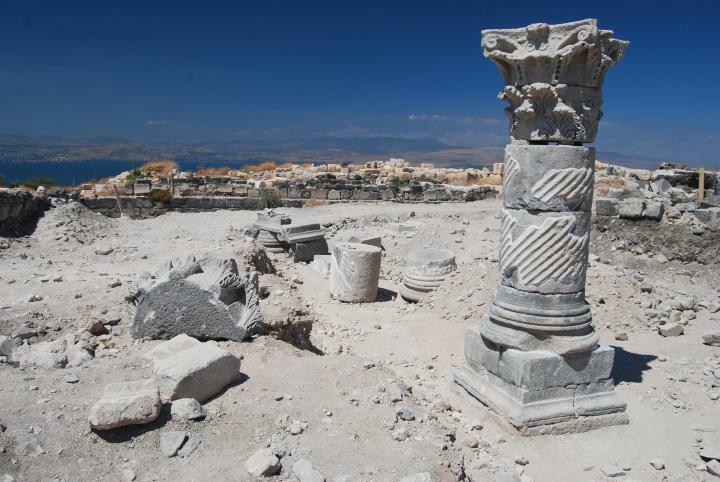 After the destruction the city was partially inhabited until the Hellenistic period when it relocated to a more defendable site - on top of the mountain. 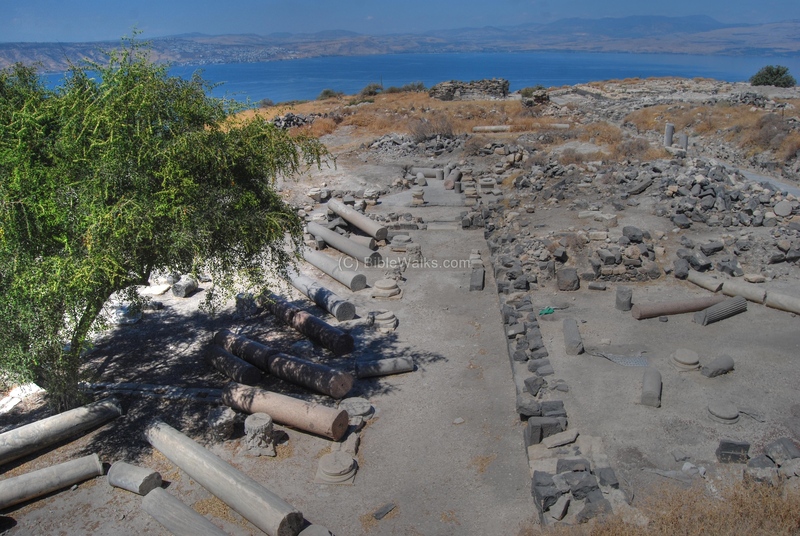 A new fortified city was established on top of the mountain in the Hellenistic period at about 200BC, and was named Antiochia-Hippos by their founders, the Seleucids. The prefix of the name was based on the Seleucid Kings' name (Antiochus) and the suffix based on the Greek name of "horse", the shape of the mountain. The city soon became a polis (city-state) with large scale construction of a temple, market and other public houses. The water supply - the main problem of the site without running water - was based on cisterns and large water reservoirs that would fill up during the winter. The city's port was relocated south of Tell Ein-Gev. 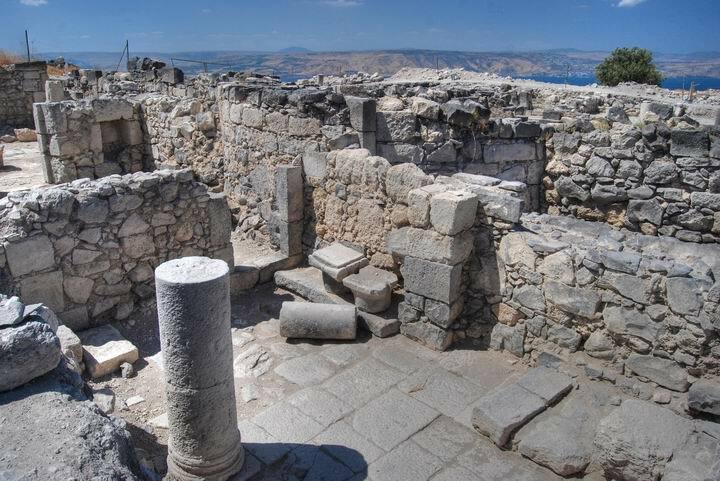 The city was conquered in 83-80BC by the Jewish Hasmonean king Alexander Jannaeus, along with a large territory in the Golan and east of Jordan, converting its citizens to Jews and adding the city and its suburbs to the growing Jewish state. After the conquest of Israel by Pompey (63BC), Hippos became under Roman control. Pompey detached the Hellenistic cities from the Jewish state, linking them to Syria. This political reform made the city one of a group of 10 great cities ("Decapolis" - the informal Roman pact of 10 cities) which included Beit She'an (Scythopolis), Gerasa (Jerash), Pella (east of Irbid), Philadelphia (Amman), Dion, Canatha, Raphana and Damascus (as a honoree city). The Decapolis union is referred in the New testament in some of Jesus travels and acts (Mk 5: 20: "And he departed, and began to publish in Decapolis how great things Jesus had done for him: and all men did marvel"). 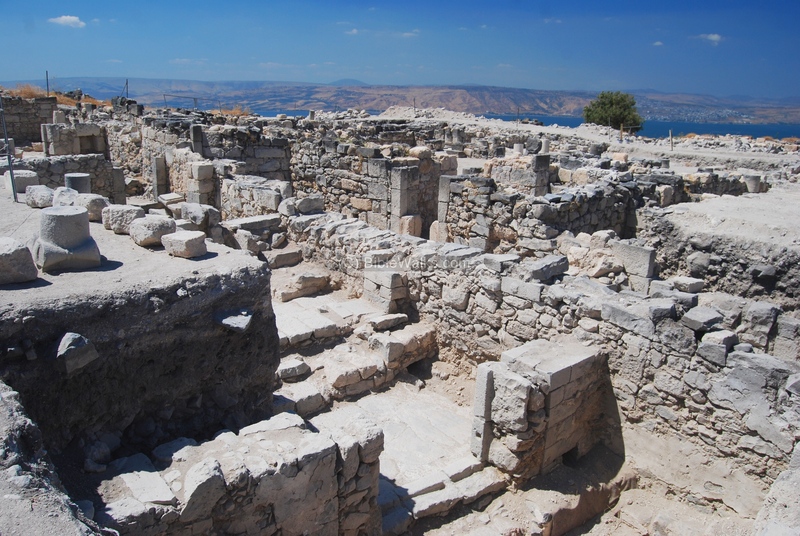 The city returned to the Jewish state for a brief time (30BC-4BC), as a gift from Augustus Caesar to Herod the great, after the Caesar defeated Anthony, in spite Herod's alliance with Anthony and Cleopatra . Herod kept the status of the city as a Polis (city-state) - who controlled its territory and colonies beyond the city itself, keeping its own customs, festivals and establishments. After Herod's death, Augustus returned the city's control to Damascus. 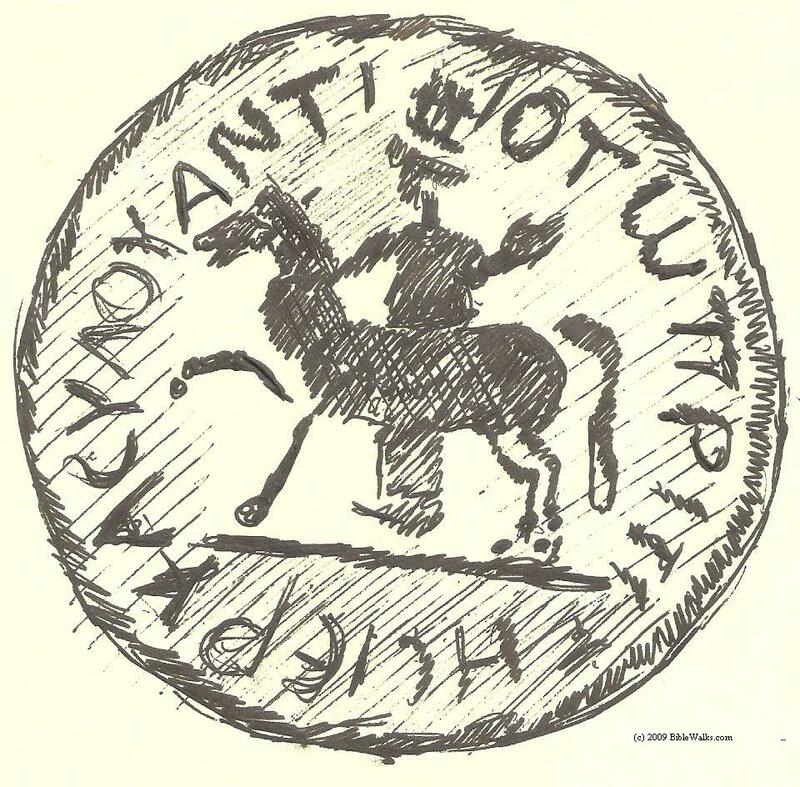 Hippos was semi-autonomous: the city minted their own coins, bearing a figure of a horse - the symbol and name of Hippos, and counting the years of Independence from 63BC (the "Pompeian" year count). 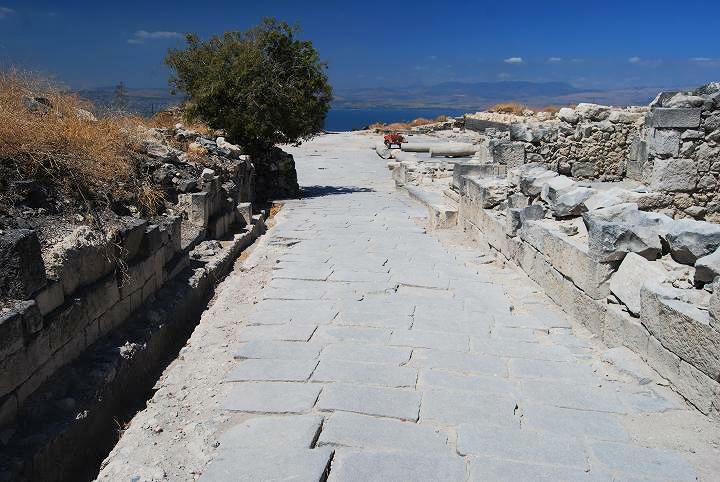 The Romans rebuilt the city with the construction of new Roman-style roads, incorporating the Hellenistic city within the new constructed city. New public buildings were constructed, including the Forum and structures around it at the end of the 1st C.
To enable the city to expand, the water supply required a substantial boost. Roman engineers constructed two long aqueducts of 25KM from Samach brook to the hill east of Hippos, and then over the valley to the east gate with an underground pipe (using the siphon technique which was based on modular basalt units). The Great revolt against the Romans (66-67AD) brought catastrophic changes to the Galilee and Golan. Josephus Flavius wrote about the territory at the time of the revolt (Wars 3: 3: 1): "...the borders of the territory belonging... on the east with Hippeae and Gadaris...". Hippos was mostly pagan, as described in the Talmud Yerushalmi (Shvi'it 6), and did not join the revolt. The pagans butchered the minority Jews in the city, and in turn the Jewish rebels revenged by hitting back. 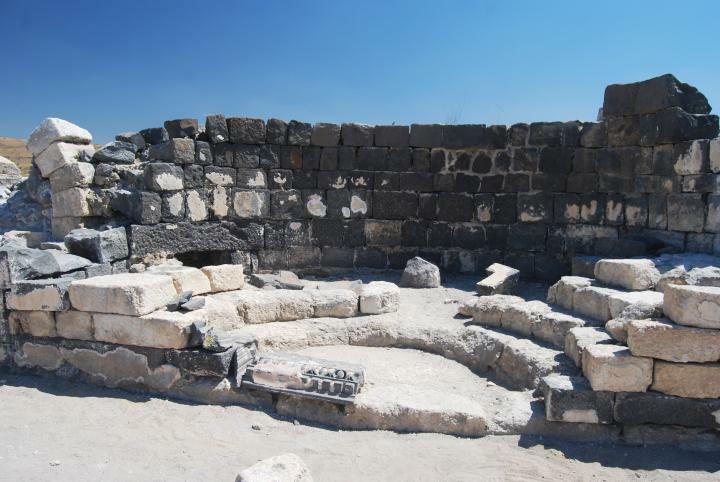 After the defeat of Tiberias, some of the citizens of Hippos were sold off as slaves to King Agrippa (Wars 3: 10 10): "he made a present of to Agrippa... the king sold these also for slaves; of Hippos, and some of Gadara ... who were of such shameful characters, that they preferred war before peace. These prisoners were taken on the eighth day of the month Gorpiaeus". Overall, the revolt caused minor damage to the city, and it soon returned to prosperity. 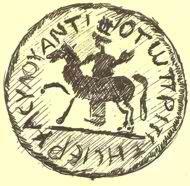 In the 4th C Christianity became the state's religion under Constantine, bringing change to Hippos. 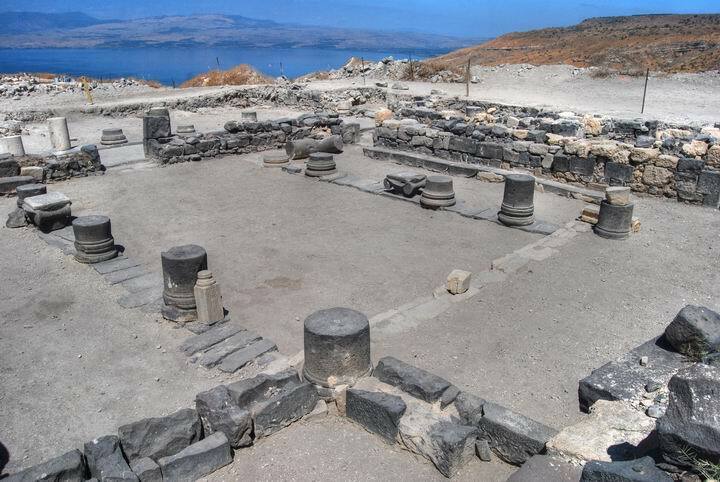 The pagan temples were converted to churches, and new ones were constructed for the growing population. 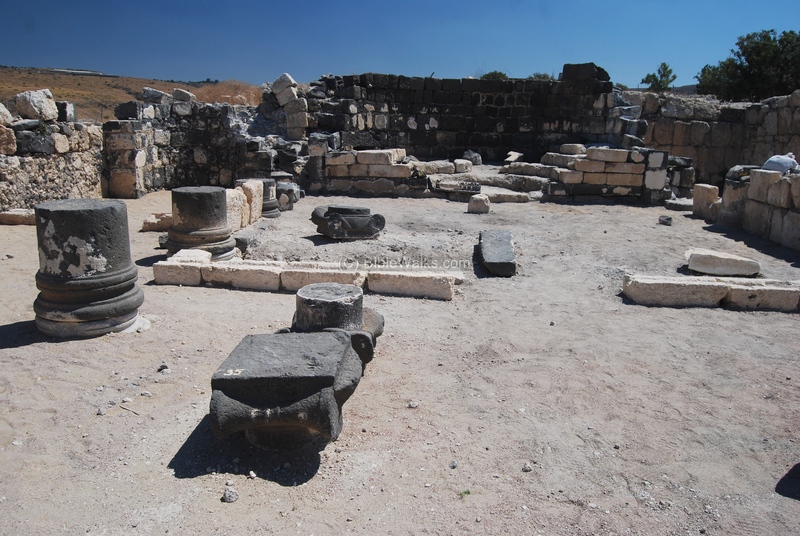 A total of eight churches existed in Hippos during the Byzantine period. Hippos became a Christian center and seat of a bishop in 359AD. A large Cathedral and baptistery were constructed in the 6th C.
In 614-615 the land was conquered by the Persians and 634-636 by the Arabs. Hippos started to decline under the Arab rule, although the tolerant rulers (the Umayyads of Arabia, 661-750) allowed the citizens to continue practice Christianity. However, a major earthquake (over 7 in the Richter scale) in749 (on Jan 18) devastated the city, as well as other places (such as Beit-Sheaan and Tiberias). The power of this mighty quake toppled most of the buildings, knocking down its massive pillars, killing tens of thousands in the region. The few citizens who survived the quake relocated to other sites in the Golan. The city laid in ruins since then, totally covered by the debris. Kibbutz Ein-Gev was founded in 1937 on the shore of the Sea of Galilee, east of Hippos/Sussita. 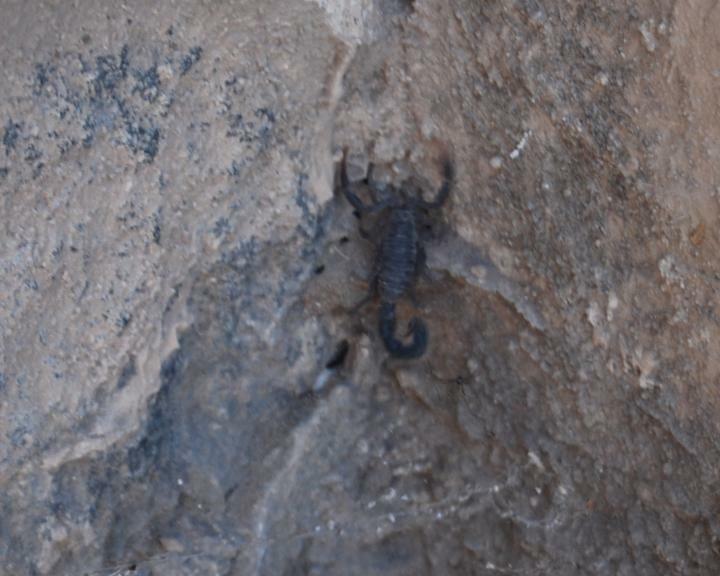 It was named after the mountain pass along Ein-Gev brook. The name is based on the Arabic name of the Bedouin village ("al-Nukayb", meaning "the pass") that was located nearby, who sold their land to the new Jewish settlers. During the Independence war (1948) the Israeli forces (IDF) captured the mountain in order to provide a protection from the Syrian forces located on the hills above the Kibbutz. Archaeological surveys were conducted here in the late 19th C by Gottlieb Schumacher. 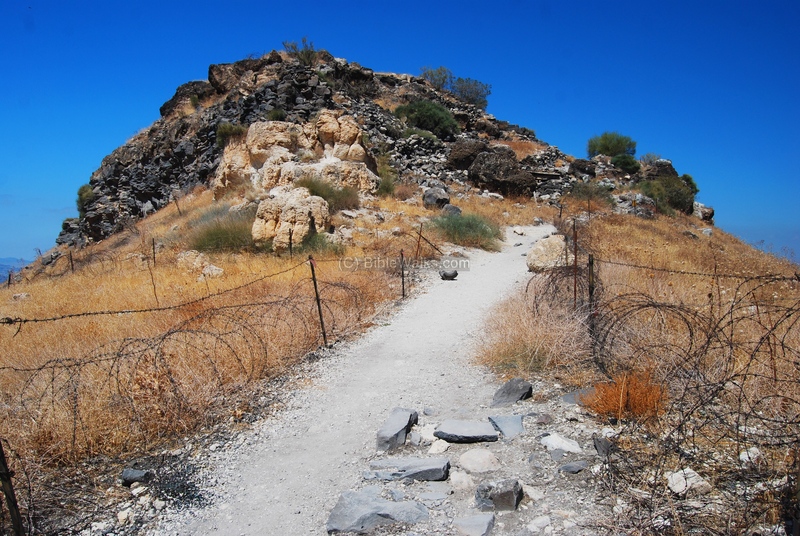 During the early 50s there were clashes on this border, and the IDF fortified the Sussita hill as a front post. 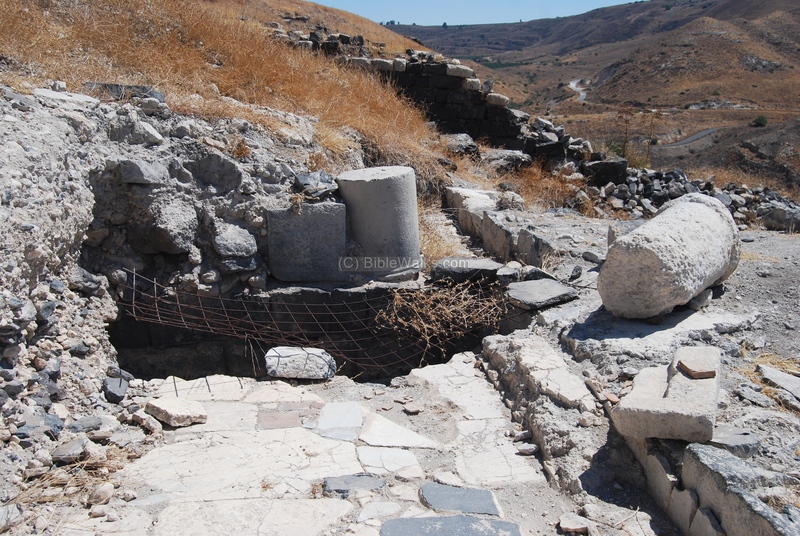 In order to preserve the antiquities, emergency excavations were held in the Cathedral area (1951-55), headed by Claire Epstein. Starting in year 1999 the University of Haifa started a large-scale expedition, headed by Prof. Arthur Segal. He was later joined by Polish and American teams. 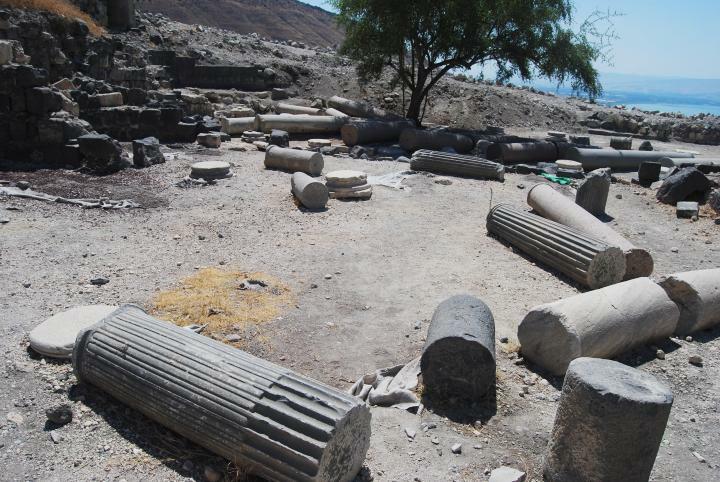 This is an archaeologist's dream - the ruins were mostly undisturbed, and the treasures found under the debris are fascinating. However, it will take years to complete this enormous task of excavation, reconstruction and preservation. The area around the site was declared a national park in year 2000. 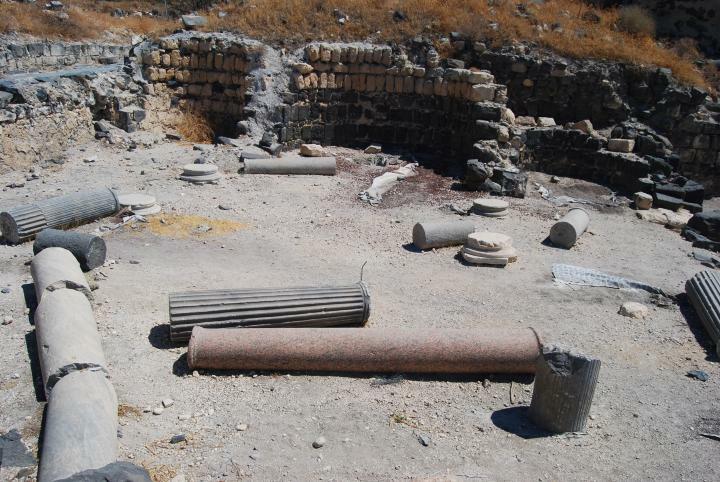 However, no new infrastructure was constructed, except for the archaeological project. The 10th season, co-directed by Dr. Michael Eisenberg of the University of Haifa, has been completed in year 2009. He recommended us to review this site as one of the places associated with the acts of Jesus. The majority of the photos were taken at the end of this season. The city was an important Christian center during the Byzantine period, and was a episcopate - the seat of the Bishop - starting at 359AD. The majority of its citizens were Christian, and the existence of eight (!) churches indicates the city's importance. 1) Hippos is a polis. That technical language is used by gospel writers for the town from which the man with the Legion came. 2) A significant necropolis borders the main road into Hippos, aligning with the setting of the story. 3) The bone profile of the site includes pigs (although these samples are from later periods). 4) Hippos is more proximate to the sea than Gadara or Jerash. 5) Hippos is bordered to the north by a deep valley that could be the abyss mentioned in Luke 8:31. Again, none of these points prove Hippos is the location of the story. But it is certainly a prime candidate". Today few pilgrims visit the site, but we hope this will change in the near future. The photos are arranged in the order from east to west and north to south. A view of Hippos/Sussita from Ein-Gev, on the shore of the Sea of Galilee, is seen below. The modern road climb up the hill from its south-west (right) side, while a winding dirt road climbs up the north-west (left) side. 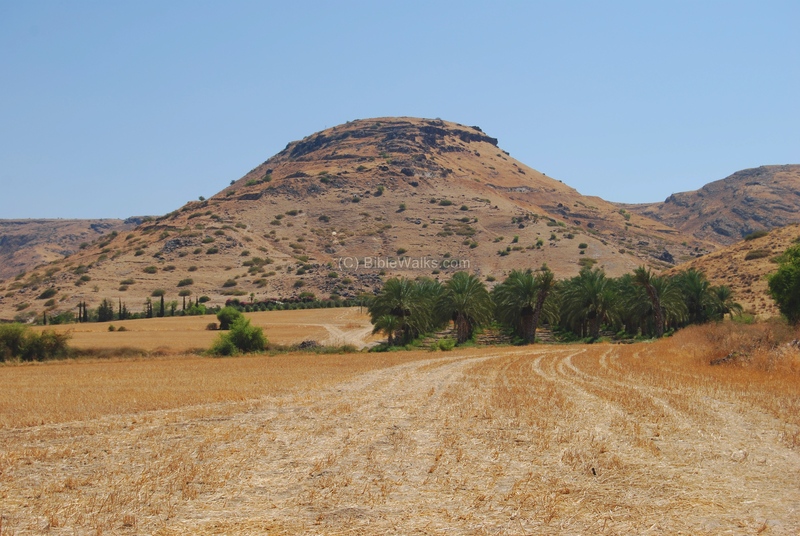 The hill is located between two brooks - Ein-Gev on the north and Sussita on the south. A closer view of the steep hill is seen below. An aerial photo of the central part of the excavations is seen in the photo below. This picture was taken from north to south, after the 10th season - (2009). 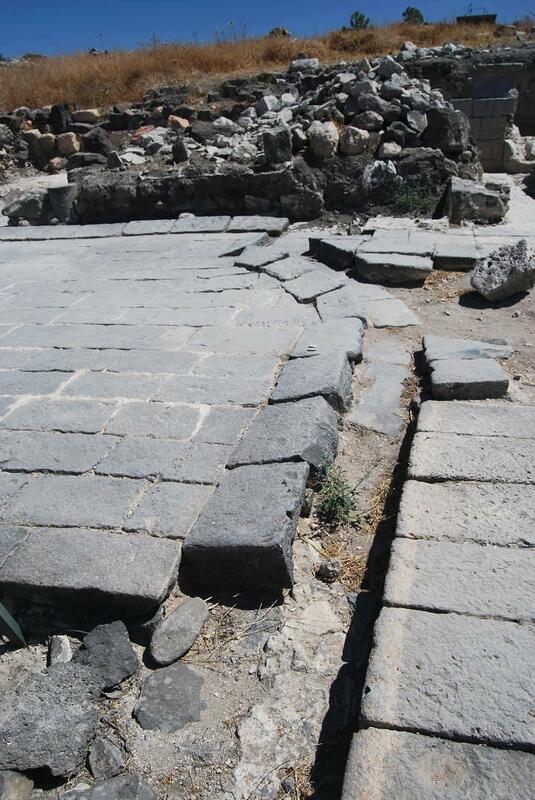 It shows the Decumanus Maximus (Roman east-west main street) stretching from left to right. 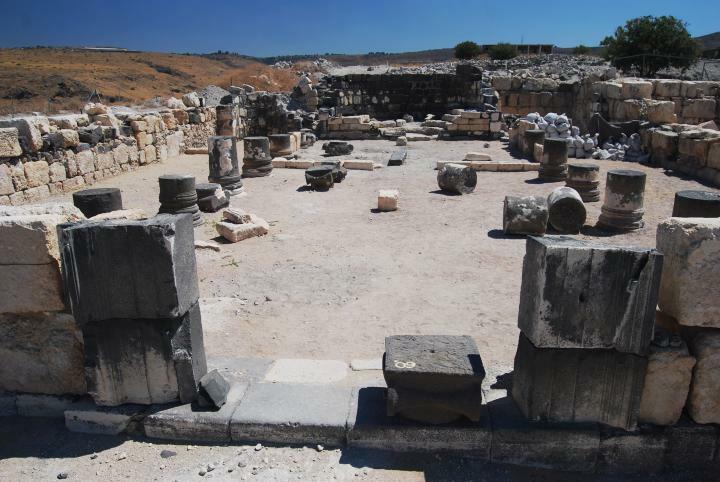 The NE church is seen on the left, the NW church on the right, and the forum just above it. A panoramic view from the east side is seen below. 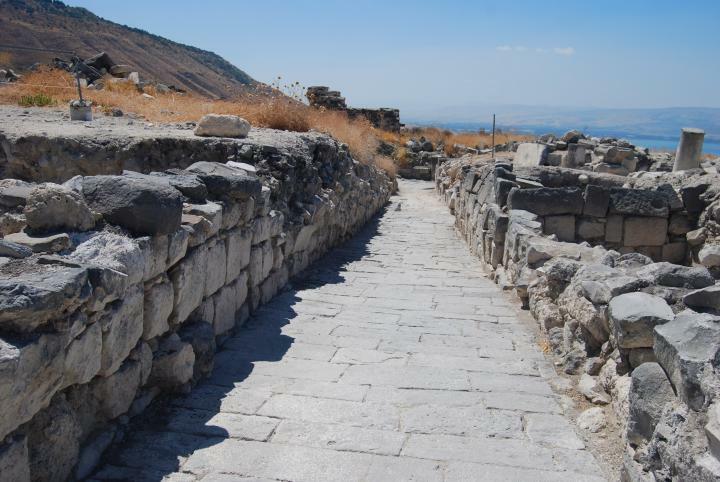 The modern road reaches this point, and a walking trail leads to the east gate which is located on the eastern foothills of the ancient city. The photo below shows a closer view of the site. The trail, seen on the right side, leads up the hill towards the eastern gate. 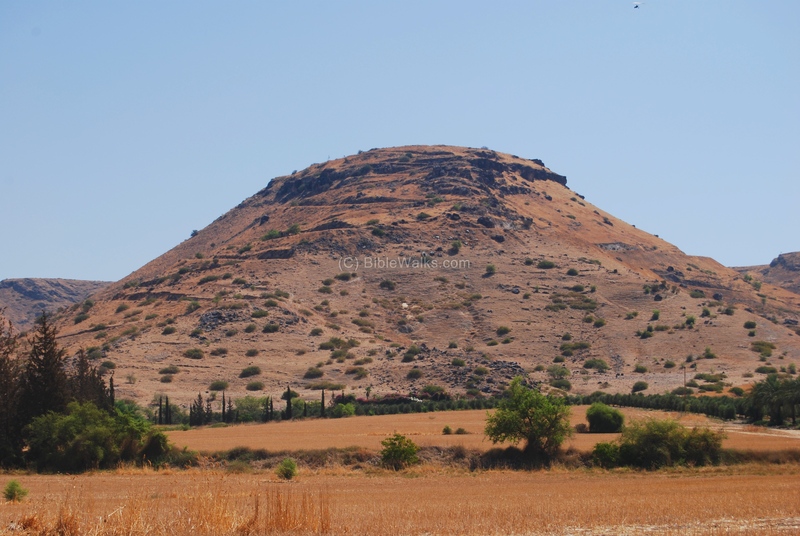 On the south-east side of Hippos is a hill with many caves scattered around it. 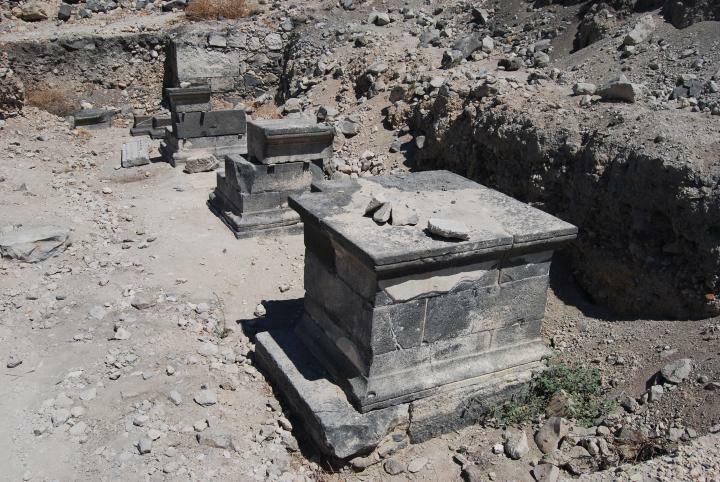 This was the Necropolis of the city. In the background is the Sea of Galilee, and on its shore is Kibbutz Ein-Gev. Across the lake is Tiberias, the site of another great Roman city. 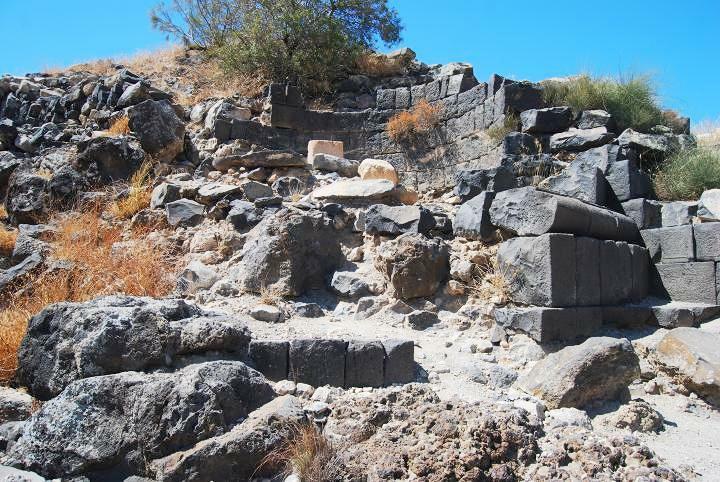 Along the trail are sections of basalt drums, belonging to the Roman aqueduct which fetched water from springs located 25KM away. These modular units were connected to each other, plastered at the joints - thus creating a sealed pipe. This enabled the use of a siphon to move the water across the valley into the city. 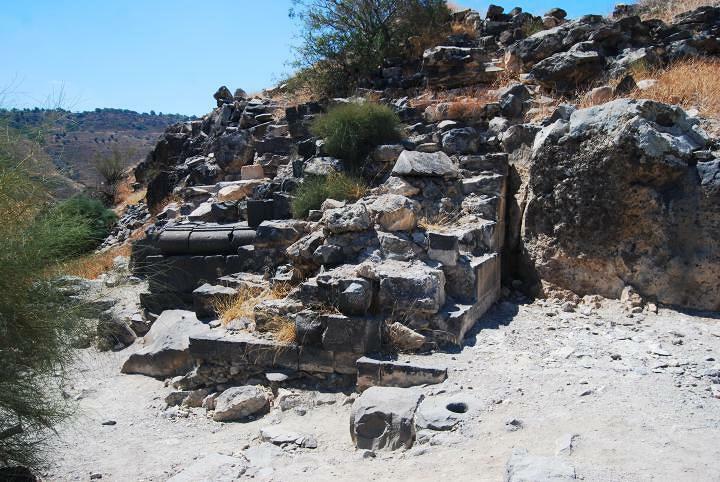 The ancient gate is located on the eastern edge of the mountain, and protected the entrance from the Golan into the city. In modern times, during the 1950s, the gate area was fortified by the IDF as a front post. It was located on the border of Israel and Syria, but later became part of Israel after the six day war in 1967. Both sides of the trail are fenced off and mined, so do not cross the barb wired fence. 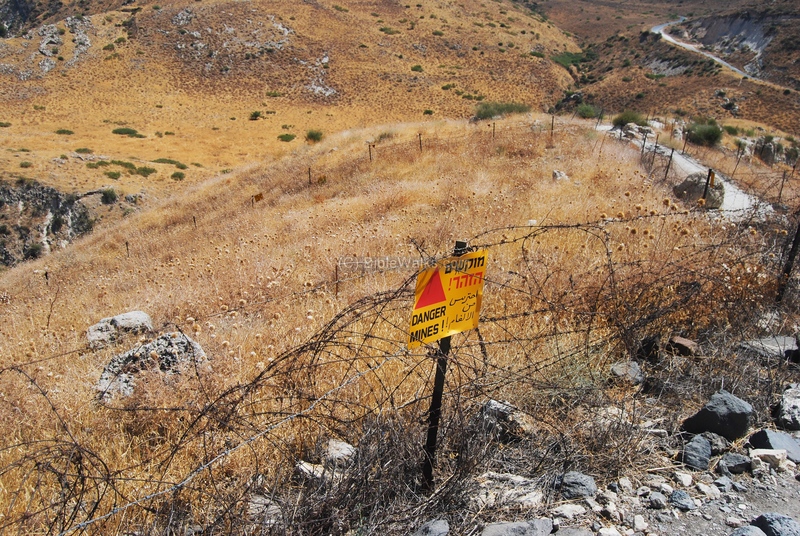 Yellow signs with red triangles mark the edge of the minefield, exactly below the trail. A view from the modern bunker towards the east side is seen below. In the background are the hills of the Golan heights. The road continues up to a junction near Afik. 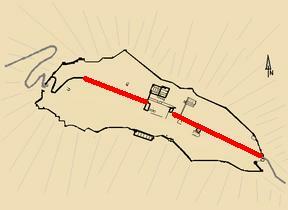 The location of the east gate is marked by a red marker on the plan of the city. It is situated on the eastern edge of the mountain's cliff, embedded into the city walls. 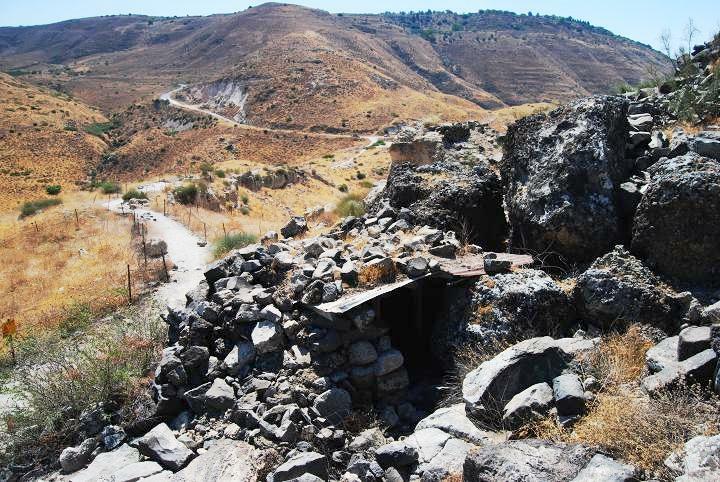 This was one of the softer defense points, since the ridge connecting this end to the Golan foothills made it relatively easy for the enemy to penetrate the city. Therefore, a strong gate was constructed at this end. The gate has a round tower on its south side and a square tower on the north side. Beyond the gate is the main street of the city. 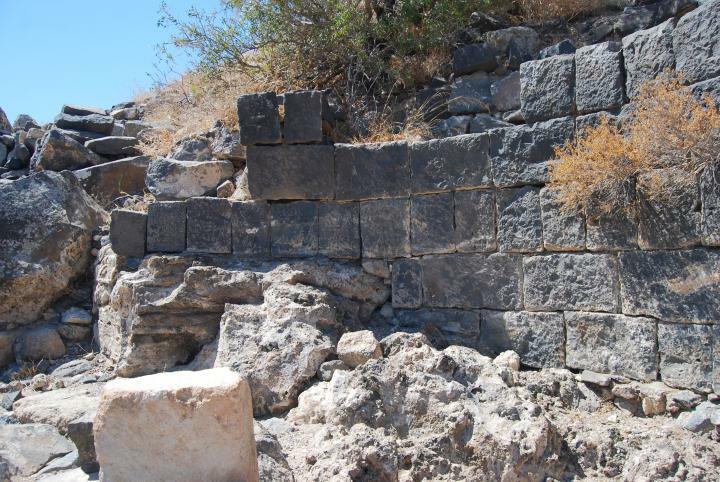 Sections of the ancient Roman gate is seen below, which is built in high quality and of basalt stone. A high round tower is located above the gate on the south side, built of small basalt ashlars without mortar. It has an external diameter of 8M and internal of 4.8M. The photo below shows another view of the east gate, showing a section of the southern side of the gate post. The northern side is missing except for its base, with a 3.20M opening. The archaeologists estimate the date of the gate's construction to the end of the 1st C AD, with some later repairs added to the gate. The square gate on the other side has a completely different design, built in a lower quality, and very little remained from it. It overlooks the abyss, as seen in the photo below. This is an unusual gate design, since most tower gates are symmetric in design. Behind the gate is another visible section of the aqueduct. This is the main colonnaded street of Hippos. It runs a total length of about 500M , connecting the city's two gates along its main axis. The street is named "Decumanus Maximus", the Roman word for east-west main street. The main buildings of the city lie on both sides of this road. The plan of the city is seen on the right; the location of the Decumanus Maximus (main east-west street) is marked by a red marker. It connects the eastern gate to the western gate. The Forum is located in its center, marked by a gap between its two sections. About a half of the street was excavated and reconstructed by the end of the 10th season (2009), mostly on its eastern side. The eastern section of the paved road is seen below. The Roman aqueduct pipes followed the path of the paved street, flowing east to west. A hole in the street revealed a section of the pipe, with a junction that diverted the water to the buildings on the side of the street. 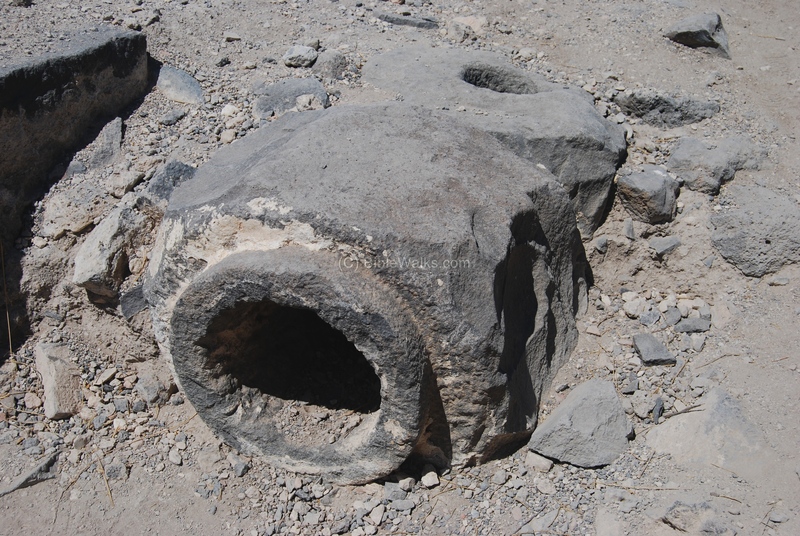 A basalt drum, belonging to the aqueduct, is seen split in two further along the Decumanus Maximus street. Another section of the road, in the center of the eastern side, is seen in the photo below. On both of its sides are buildings which have not yet been excavated and reconstructed. 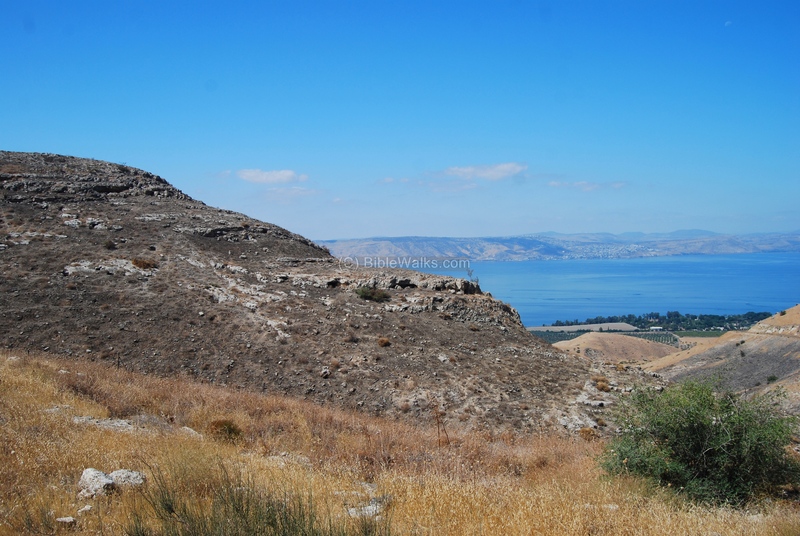 The Sea of Galilee is seen at the edge of the road, and the top of Mount Tabor is seen behind it. Along the eastern section are two corner fragments of a cornice from a monumental Roman building, seen below on the side of the road. The street reaches the Forum at the center of the city, seen below on the far right side. The Sea of Galilee is seen in the background. The north-east side overlooks the Ein-Gev brook, which flows deep below the mountain of Hippos - more than 200M below its level. A panoramic view of the north side is seen below. 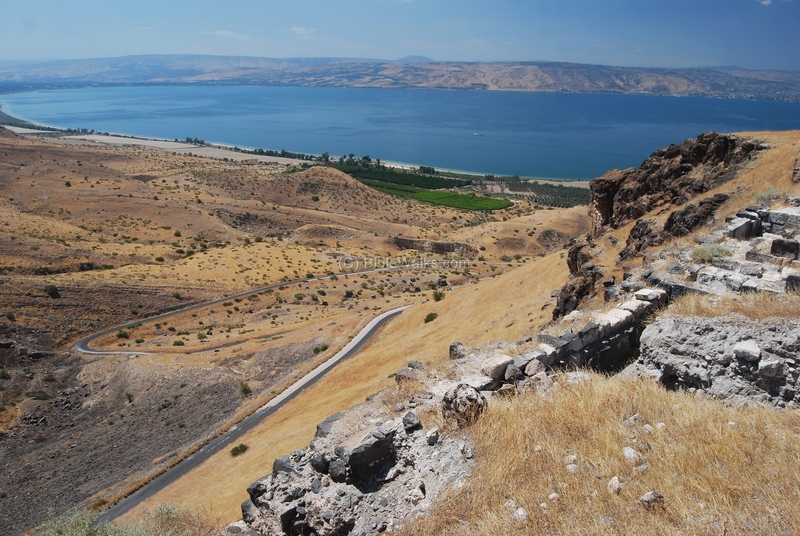 On the left side is a section of the sea of Galilee, and the "horn of Ein Gev" - a pointed hill - is seen on the leftmost edge of the hills. Clicking on the photo will open a flash viewer, which will allow you to move left/right/in/out/full-screen. 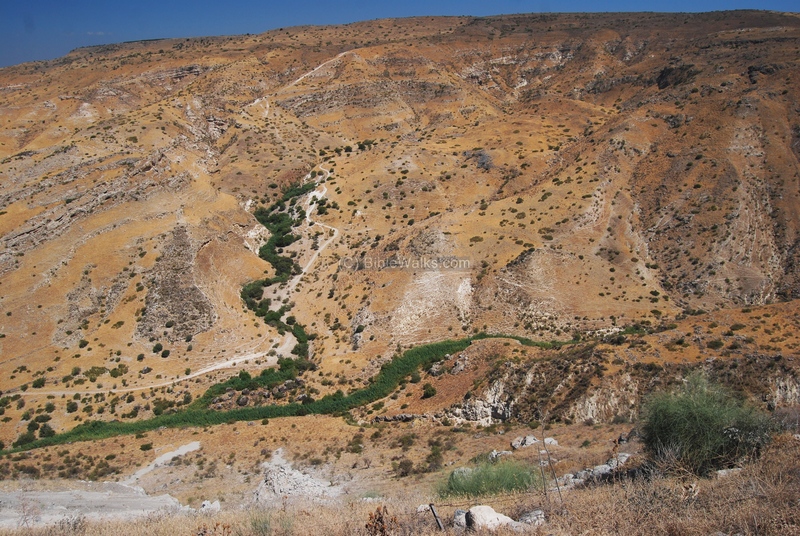 A closer view of the Ein-Gev brook is seen below, with a year round running water from the springs of Afik in the Golan. 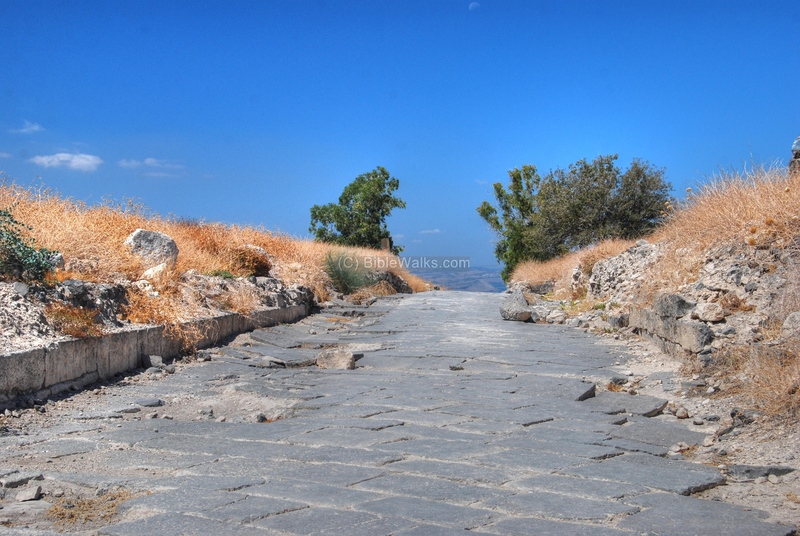 This was one of the ancient mountain passes from the Sea of Galilee to the Golan and north to Damascus. It may have been the reason why the city was built at this place - a gatekeeper of the ancient trade route. On this north-east side of the city is a Byzantine residential area, which includes a church. This section was excavated in seasons 2006-9 by the American group. The archaeologists reconstructed a dense residential quarter which was built in the 4th C AD, and destroyed by the great earthquake of 749 AD. The plan of the city is seen on the right; the location of the North-East section, and the Church at that area, is marked by a red marker. A view of some of the quarter's houses is seen below. These apartments were used by the Roman middle classes and termed "insulae". 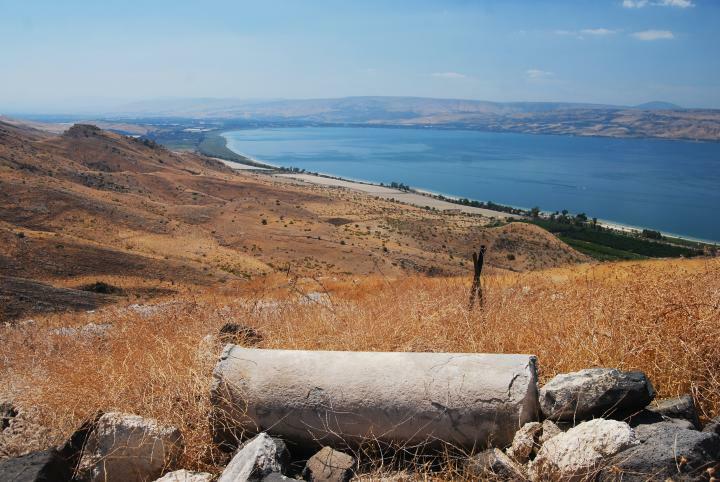 The sea of Galilee is seen in the far background. Another section is seen below. The houses are built of small hewn rocks. 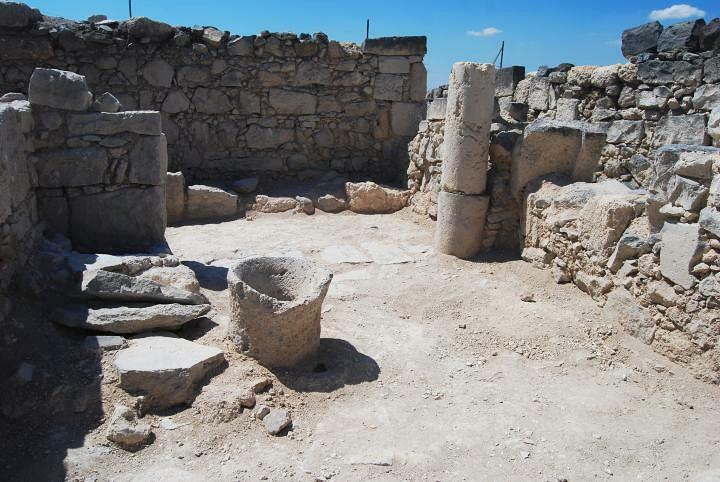 The common architectural design of these houses is a central yard which is paved with stone slabs, where the cooking and daily household activity was conducted. The central yard was surrounded by a number of residential rooms. 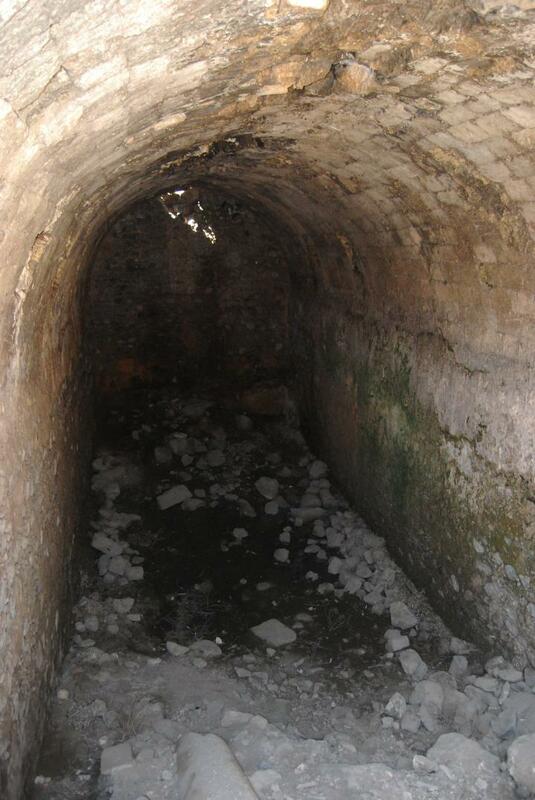 One or more water cisterns are located under each house, which provided the water supply. A water basin is seen below. 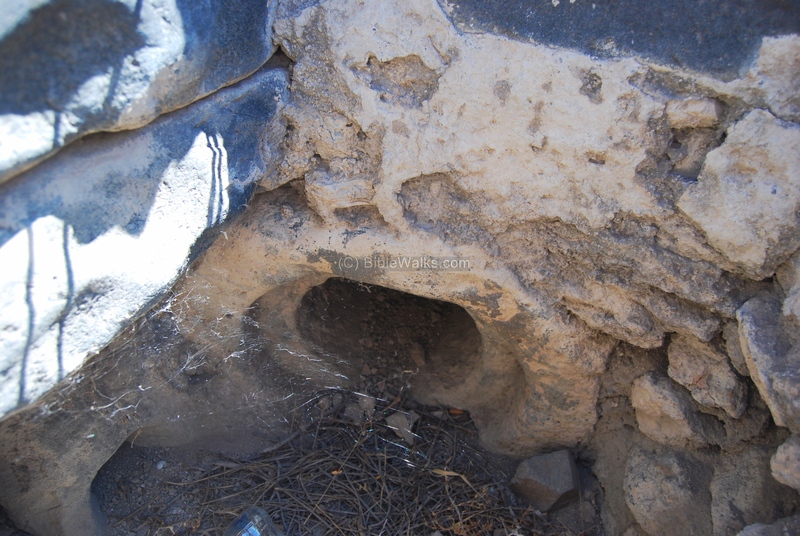 Some of the architectural elements, such as the water basin and a section of a column, are seen partially excavated in the rubble that covered the area since the 8th C. The archaeologists unearth the debris, reconstruct the pieces together and bring the Byzantine houses back to life again. A maze of intersecting streets connect the houses. Several wide north-south streets connect the houses to the main road (Decumanus Maximus). The street, 2.2-2.4M wide, reaches the main street (Decumanus Maximus), as seen below. Along the street are several other houses, such as the one below with the second floor staircase standing near the entrance (seen on the left side). At the north end of this street, close to the northern walls, is the NE (North-East) church. It is smaller than the NW church, but similar in its plan. The church is seen below from the north-west corner. A staircase to the second floor is seen next to the church's northern wall. 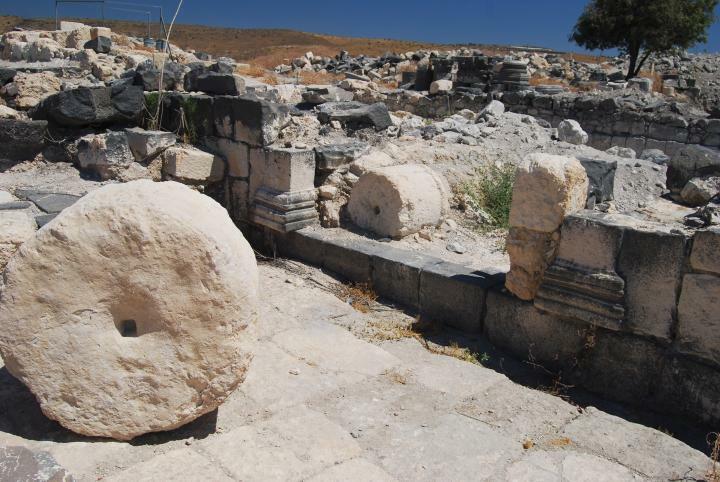 A flour mill grinding stone, used to grind the wheat grains and make bread, is seen in the left foreground. A view from the western entrance is seen in the photo below. The apse of the church is located at the far end, oriented to the east - as most Churches. A view of the church - from the south-east corner - is seen in the photo below. Its size is almost square in shape (12m x 12m) and is divided by two rows of columns, each with four columns. The prayer hall has a nave (6m wide) and two aisles (3m wide each). The church is built of basalt stone, ashlars and rough stones. A closer view of the semi-circular altar is seen below. It is located in the middle of the prayer hall and extends externally towards the east. Its wall was plastered and painted. A lower wall (1m wide, 30 cm high) follows the apse from the interior - the base of a synthronon (rows of built benches, arranged in a semicircular tier, in the apse of a church). A chancel screen was located 3m before the apse, and its fragments were found scattered around. A pair of burials were exposed here in the chancel area in front of the apse, including a limestone sarcophagus (2m x 0.70m) half-buried in the floor on the south-east corner, which contained the bones of a 60 years old woman. Its lid was inscribed with a cross and two Greek letters (alpha and omega) which are Christian symbols (represent that God is eternal - spanning the beginning and the end). The Forum is the main public square of the Roman city. This broadly paved rectangular plaza, built in the end of the 1st C AD, is surrounded by colonnades on three sides. 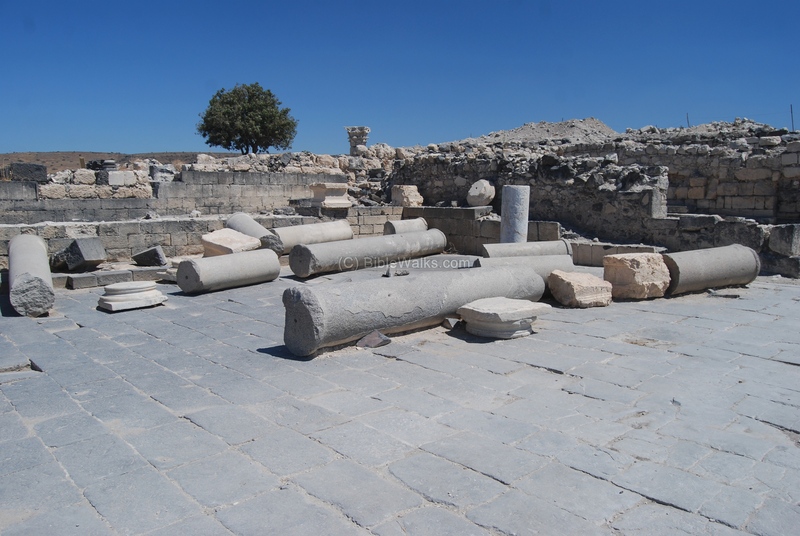 Fourteen grey granite columns are scattered around, fallen by the massive earthquake of 749AD. The central paved area is 13 x 25M, paved with rectangular basalt flagstones (40cm x 70cm). It may have been constructed in the 1st C AD or the beginning of the 2nd C.
The Forum location on the map is marked by a red marker. It is located in the center of the city, and crossed by the main east-west road. 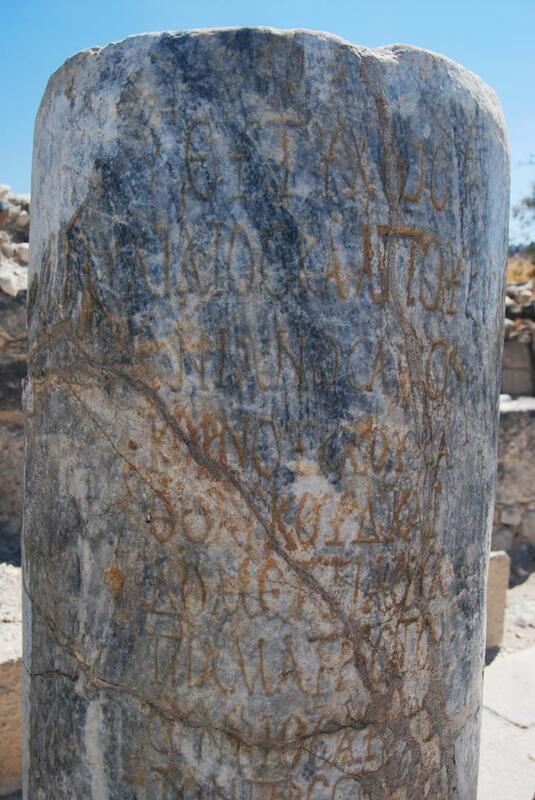 A 3rd C AD Greek inscription is seen in one of the marble columns. "Good luck. Aelius Calpurnianus, the former cornicularius (in the office) of the procurator summarum rationum, and Domitia Ulpia, matrona stolata, his wife, (erected the statue of) the ambassador, to the native city. In the year 302, (in the month of) Dios (day) 8". (by the Pompeian calendar, starting in 63BC, which means this was erected on 238/239 CE). 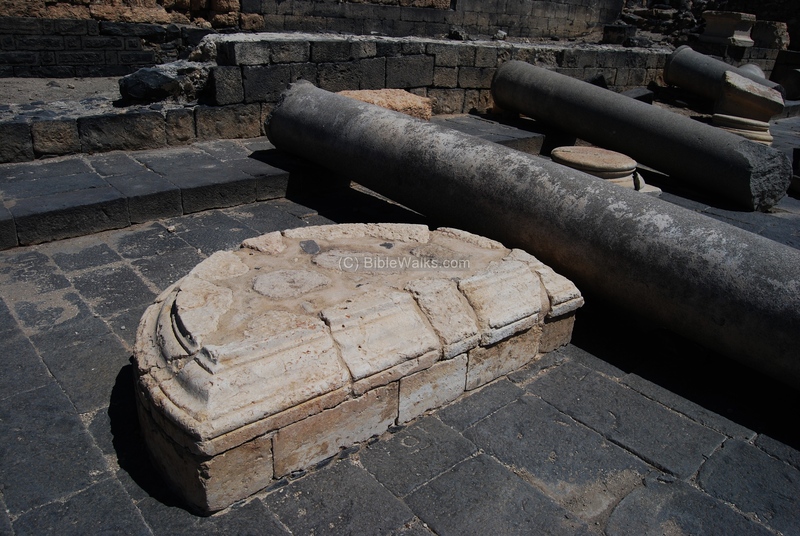 The most important find in the area of the forum is a semi-circular limestone base, which served as the base of a statue. This podium testifies to the character of Hippos as a true Polis. The rear side of the paved area of the Forum is seen below. Behind this area was a Basilica - another public section of the Forum. While the Forum was an open air area, the Basilica was a roofed structure. The western entrance to the Basilica is seen below. The excavated basilica is seen below. The rectangular structure was built on a north-south axis. The roof was supported by the walls and columns. 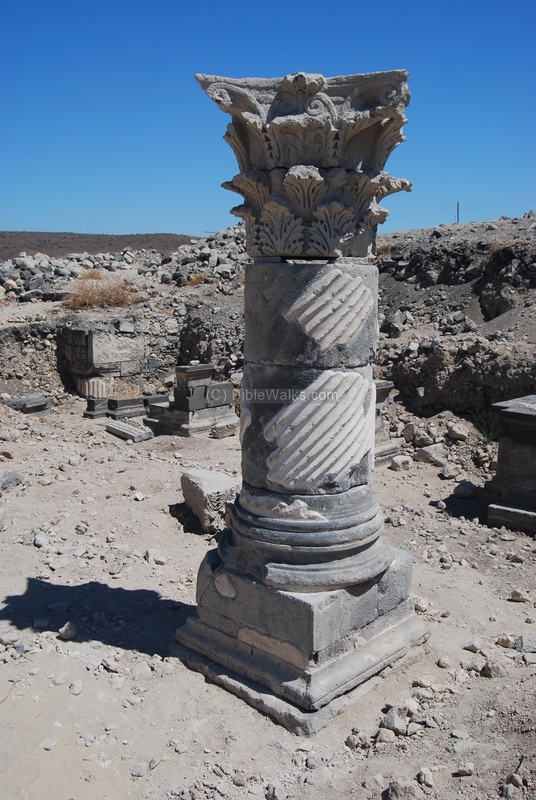 The central piece in this structure is the beautifully executed Corinthian capital. Additional Roman podiums are located on the eastern side of the structure, and were carefully reconstructed by the archaeology preservation team. Another view of the reconstructed structure is seen below, with the Forum in its background. To the west of the Forum stands a rectangular structure (18M x 9M). This was a Roman monumental structure that may have served as a Kalybe - a Roman temple dedicated to the Emperors. 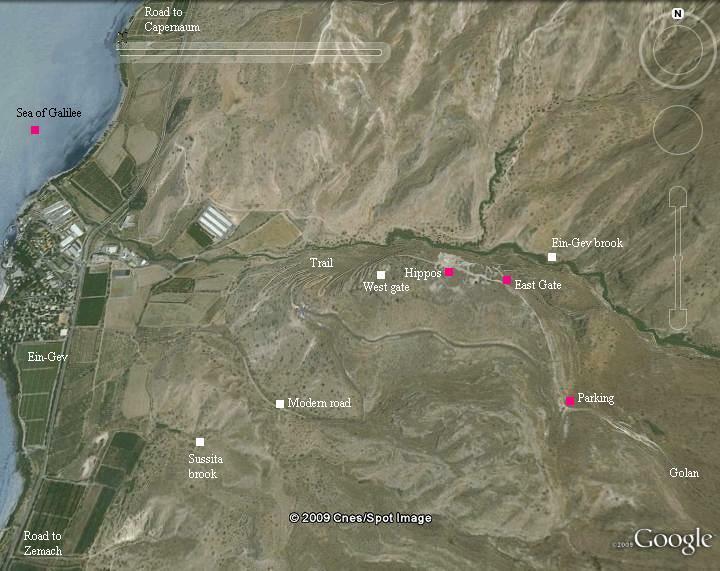 It is dated to the end of 2nd C AD or the 3rd C.
The location of this structure on the map is marked by a red marker. It is located in the center of the city, on the west side of the Forum and south of the main east-west street. 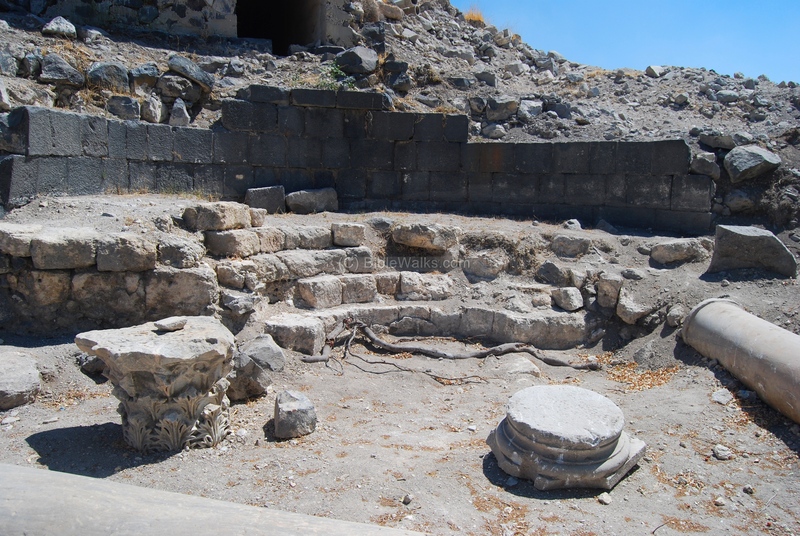 It was initially assumed that the structure was a Nymphaeum - a monumental public fountain - but the lack of water pipes changed the interpretation of the structure. A closer view of the structure is seen below. The current structure is 3M high, and is constructed by basalt ashlars which are connected without mortar. A semi-circular apse is located on the eastern side (left side of the photo), which may have been covered by a roof. Behind it, in the far background, is the Sea of Galilee. On the right edge is Mount Tabor. In front of the structure, on the south-west side of the Forum, is a deep water reservoir. This underground structure is 9 meters deep and supported by an arched roof. It is accessed by a L shaped staircase - which is seen on the lower part of the photo below. A closer view of the water reservoir is seen below. It is roofed by an impressive and perfectly preserved barrel vault. The reservoir measures 20M by 6M and is 9M deep, and is built entirely of limestone. 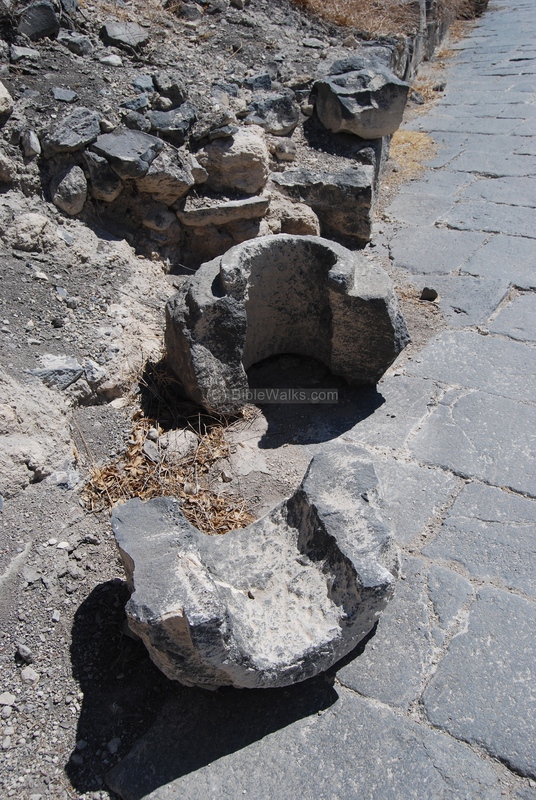 This was the main water supply for the Hellenistic city. The Romans added the aqueduct in order to accommodate the larger water demand for the expanded city. A water drainage channel is located on the south side of the Forum, which directed water into the reservoir. The North-west (NW) church is located 50M to the west of the NE church. 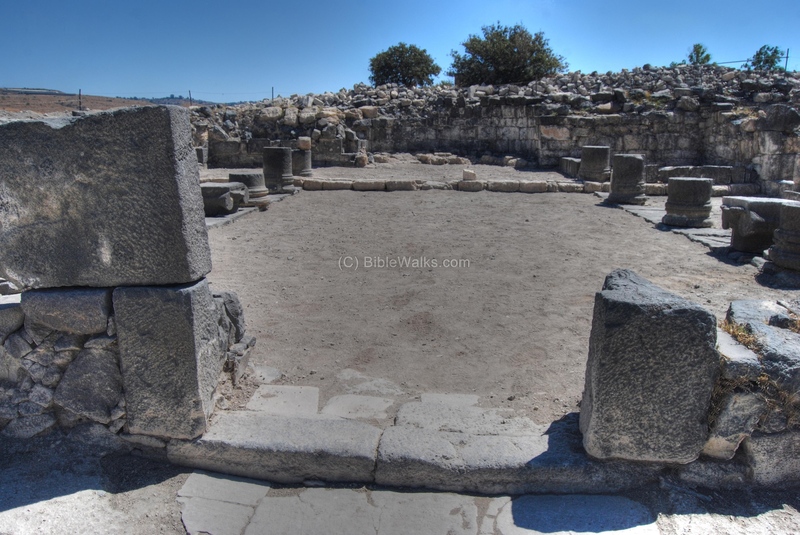 It is located within the Hellenistic compound which was incorporated into the Roman/Byzantine city, and was built over an earlier level of a pagan cultic center. 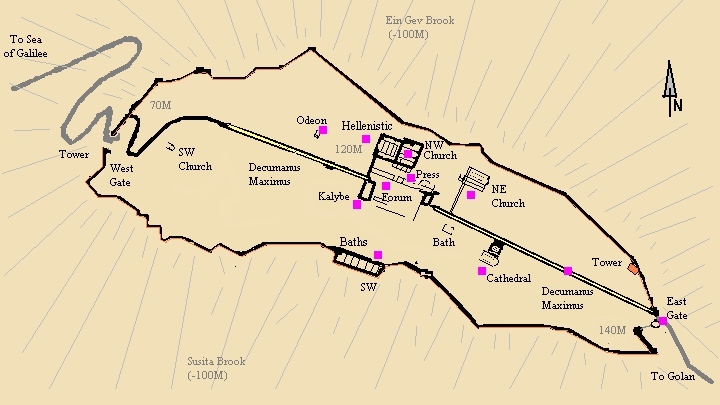 The plan of the city is seen on the right; the location of the North-West Church is marked by a red marker. 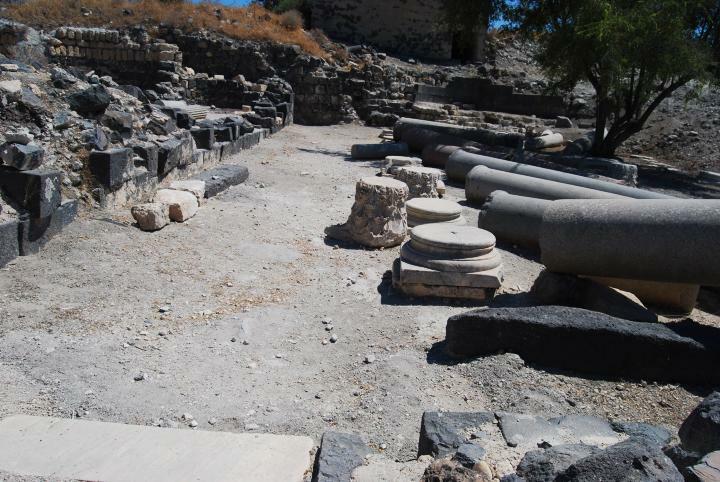 It is located to the north of the Forum plaza, within the Hellenistic compound. 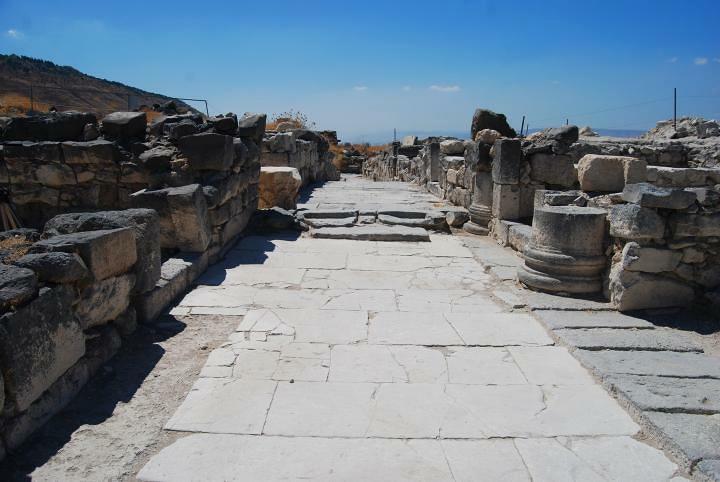 The paved area of the Hellenistic compound stretches to the north of the Forum area. It was surrounded by a colonnade. 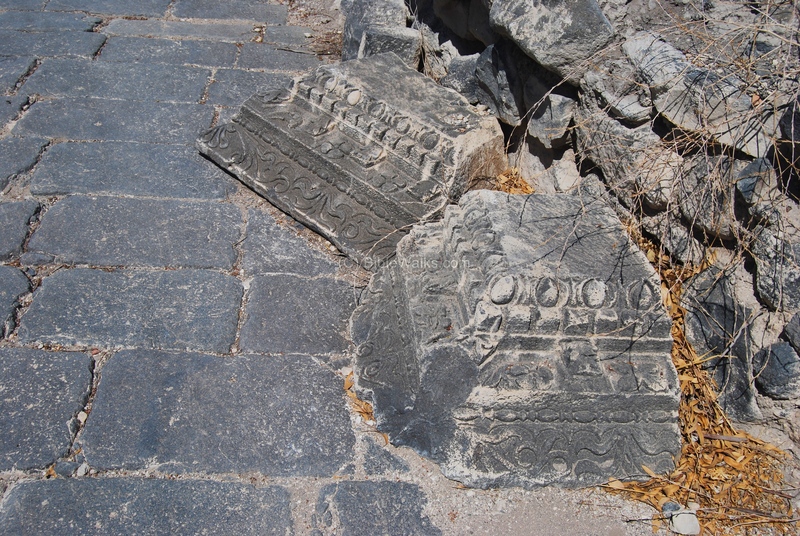 Many architectural fragments are scattered over the area, as seen below. 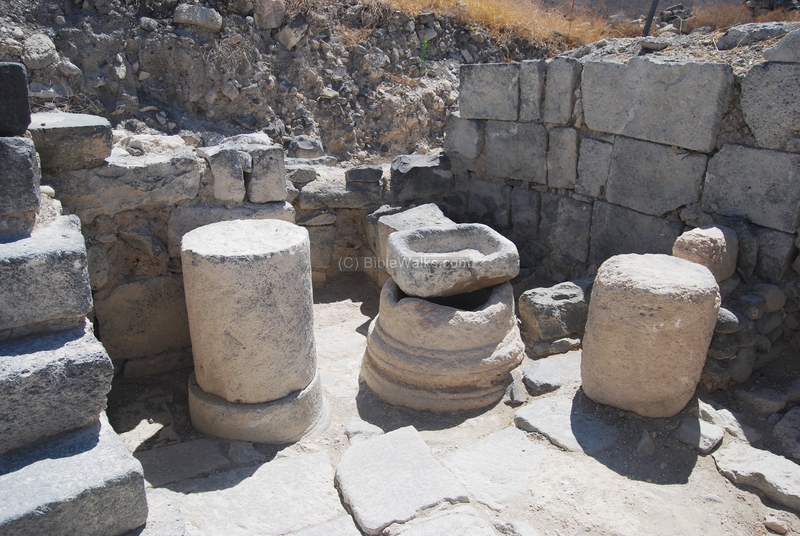 They indicate that a Hellenistic public building was erected inside the compound, built on a stepped podium - perhaps a temple in the area of the Byzantine NW church. 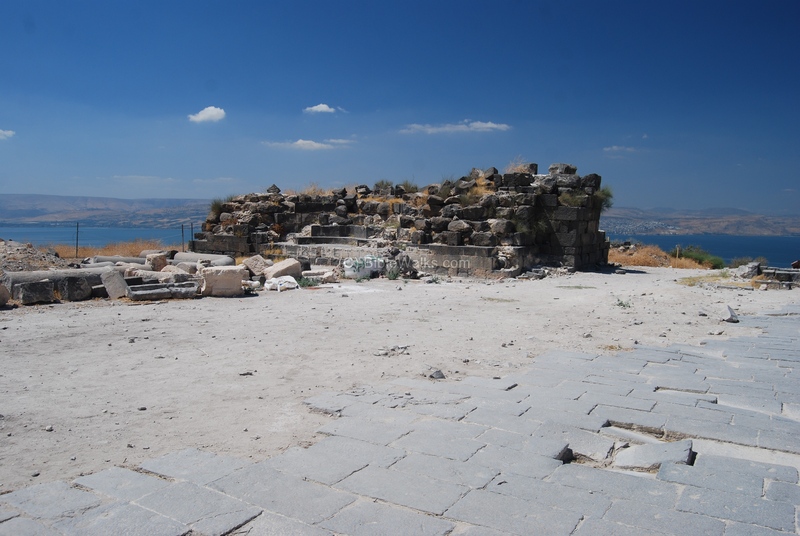 This limestone temple was built during the 2nd C BC. 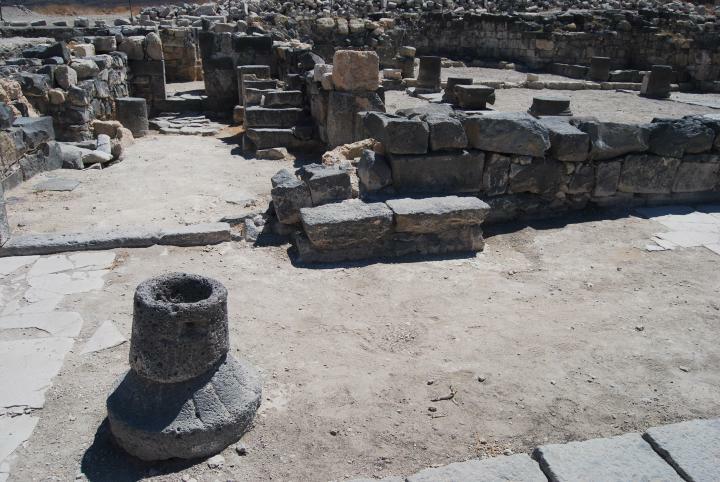 The compound continued to function in the Roman period. 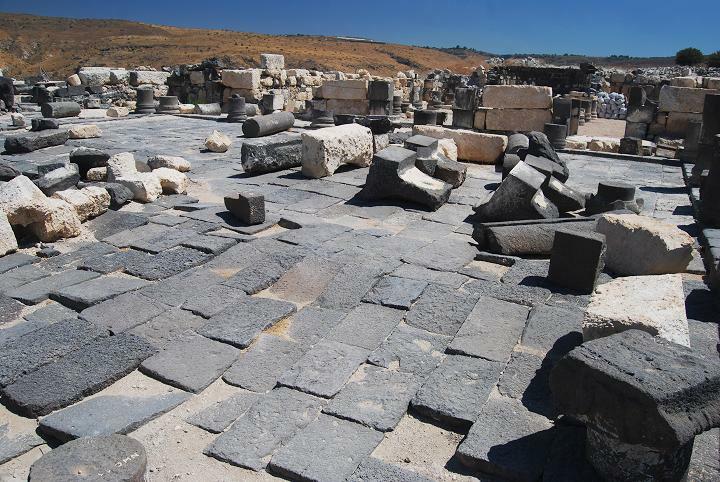 A large sized public building was erected with basalt stones during the Roman/Byzantine period, although only fragments of it were found. 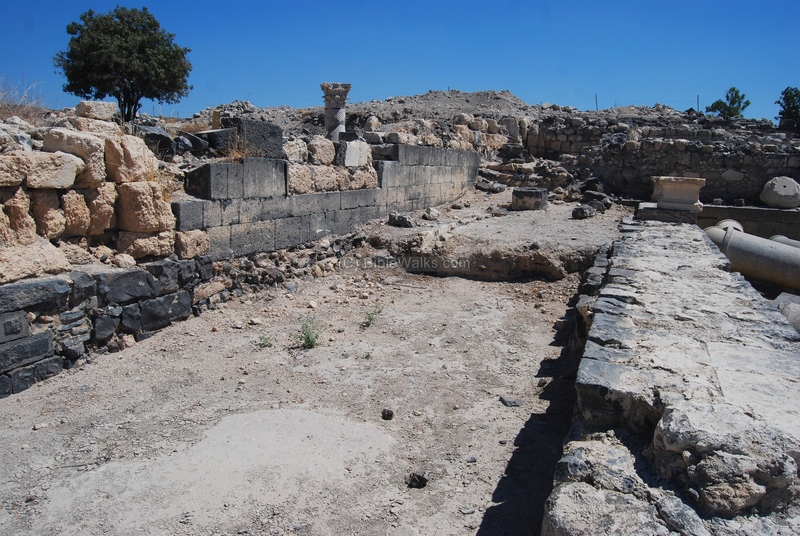 The photo below shows the eastern side of the compound, with the entrance to the NW church in the far center. On the east side of the compound is the entrance to the church, which is seen below. Another entrance is located on the south (right) side of the atrium. This church was built in the end of the 4th C or beginning of the 5th C, initially as a single-apse design. 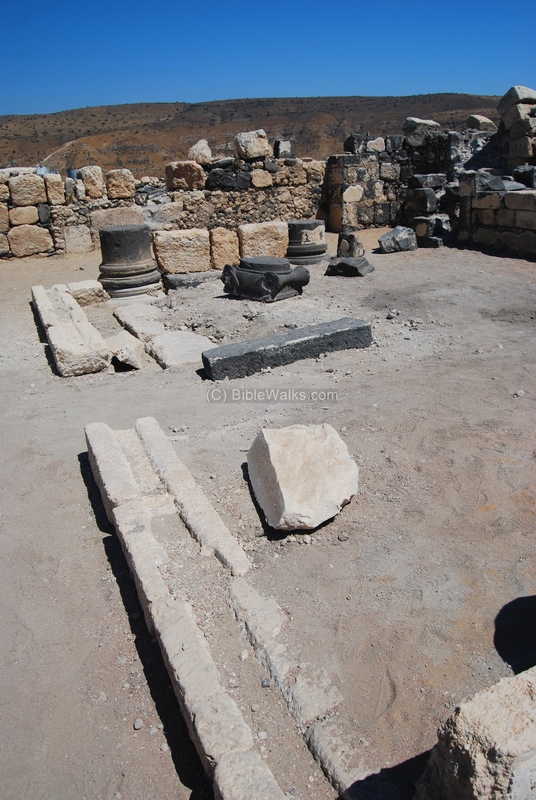 The church reused the limestone and basalt stones of the pagan temple and the Roman building which were dismantled. The church is built with a combination of basalt stones and limestone, some of them reused from earlier structures (Hellenistic limestone and roman basalt). 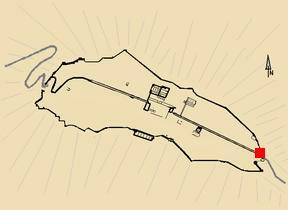 Its rectangular size is 46 x 23m, oriented east to west. The area of the atrium on the west side, seen below, is 21m x 21.5m (internally), while the large prayer hall area is 22.3 x 15m. The photo below shows a view of the east side of the church - the front section is part of the atrium, while the far section is the prayer room. The entire floor was paved by colorful mosaics, with geometric patterns and stylized plant designs. Only the mosaic floors on the two aisles survived. 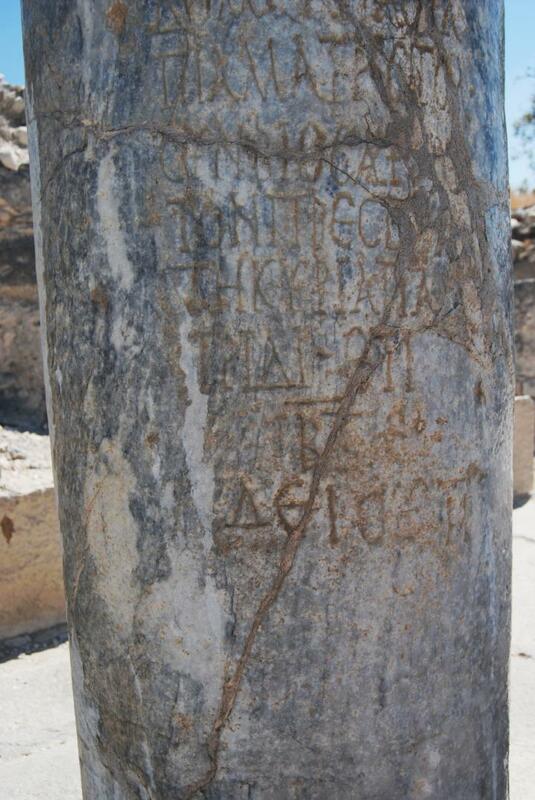 On the southern aisle are two brief Greek inscriptions which commemorate the donors (Petros and Heliodora), and date to 580 AD. In the rear of the prayer room is a central large apse. A smaller apse, constructed at a later stage, is located on the north aisle (seen on the left side). A section of an arch is seen above that apse, which supported a roof. This second smaller apse was added at the end of the 6th C, with additional reconstruction that was carried out inside the church. The passage from the atrium to the prayer room was possible through a large central entrance and two narrow side entrances. The photo below shows the northern aisle of the prayer room, where a narrow apse is located on the right. The central apse is located in the middle of the prayer hall and extends externally towards the east. 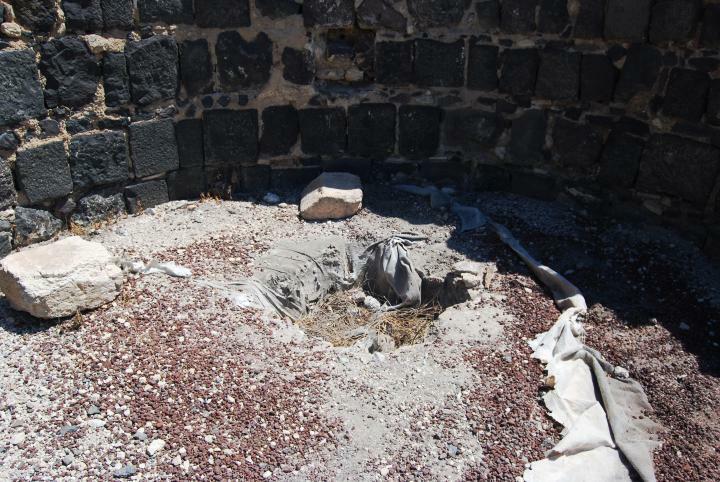 Its wall and the base layers were plastered, as seen below (with white patches over the dark basalt stone). A lower semi-circular wall (with 4 steps) follows the apse from the interior. This was the "synthronon" - rows of built benches, arranged in a semicircular tier, in the apse of a church. To the south of the north-west church are three rooms, which served as an industrial complex and storage area for agriculture products used by the priests and monks. 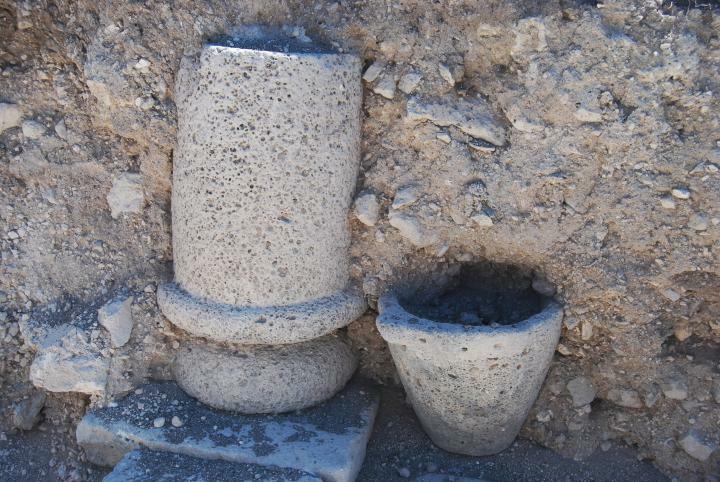 Many rich findings were unearthed here - vessels and tools, wine and olive presses. 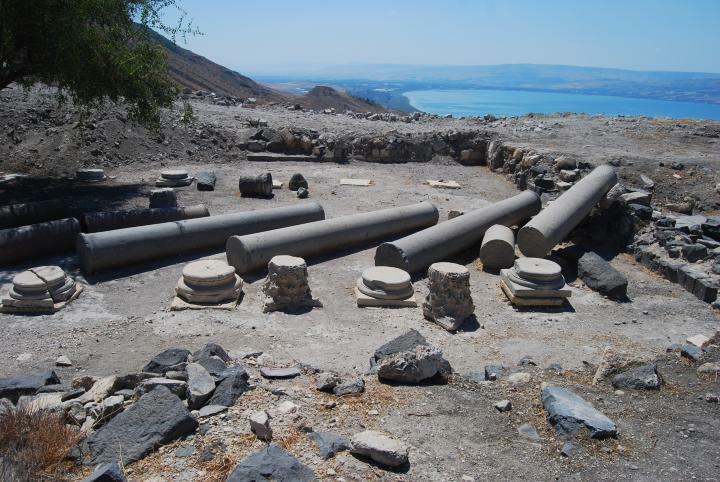 Wine and oil production was a popular industry in the Holy Land. 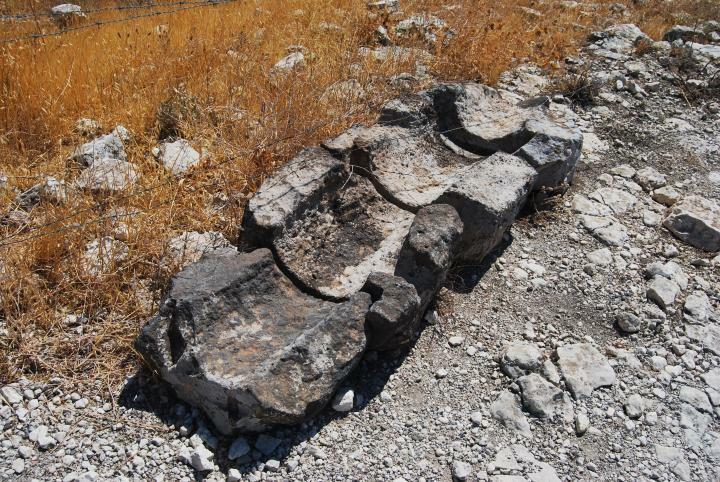 Many agriculture presses are found in most of the Biblical places and ancient sites, including Hippos. A large agriculture installation is located on the south side of the NW church, close to the Forum. It includes two wine presses and an oil press. Another wine press was discovered in the northern annex of the church. The plan of the city is seen on the right; the location of the presses is marked by a red marker. A view of two winepresses is seen below. In these basins the grape juice accumulated after it was extracted from the grapes. 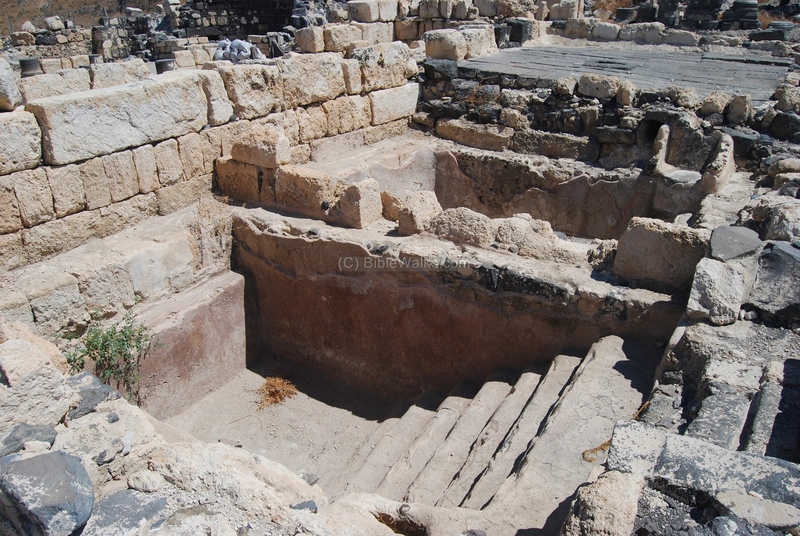 The basins are well-plastered, with steps leading to their bottom - used by the workers in order to collect the juice into jars, and clean the pool. Another view of the western basin is seen below. 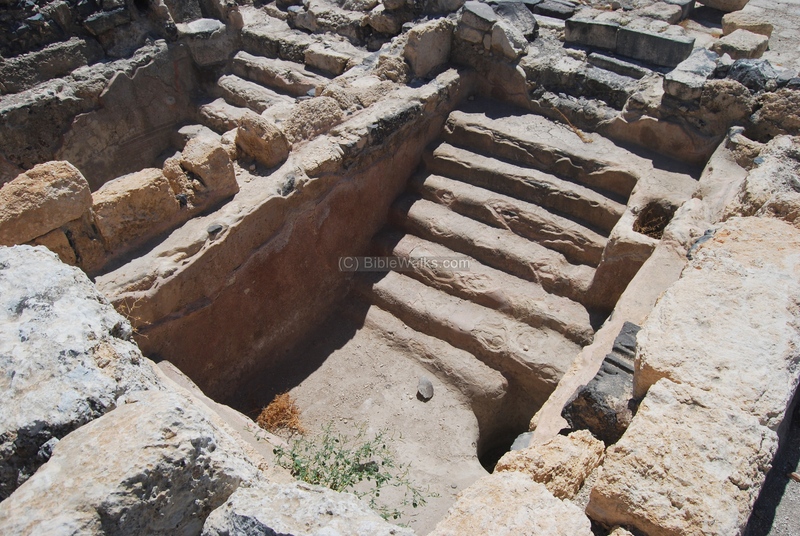 The treading floor, a large area where the grapes are laid and crushed by the feet of the workers in order to extract their juice, is located on each side of the basins. The juice and grapes would sit there during a lengthy fermentation process. 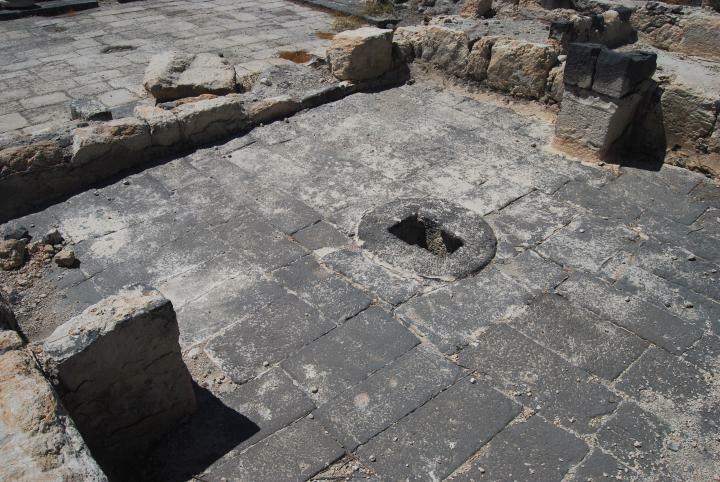 A small hole in the center of the treading floor was used for secondary crushing of the grapes, using a stone weight. The South-East church, also named the Cathedral, is the largest and most magnificent of the churches in Hippos. 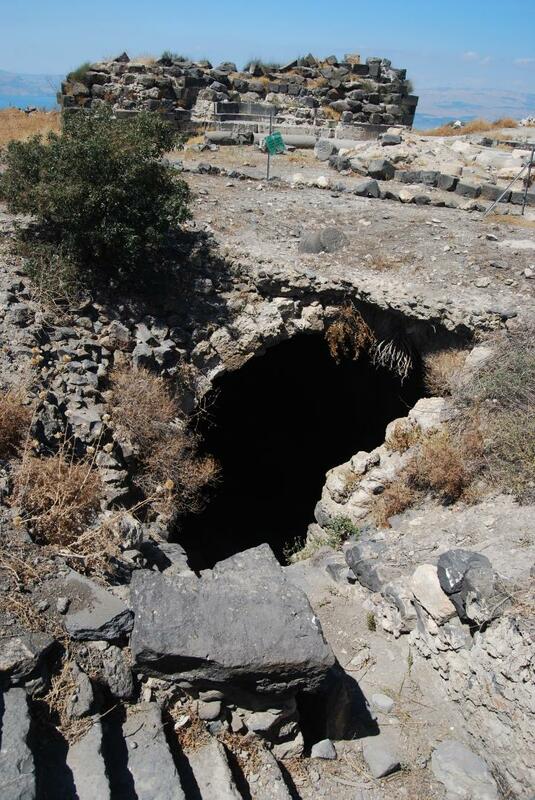 It was the only structure that was excavated before the Haifa University excavations. These excavations, headed by Claire Epstein, were performed as a rescue dig during the years 1951-1955 when the IDF fortified the hill during the clashes with the Syrian army. Its location within the plan of the city is seen on the right and marked by a red marker, south of the main east-west road. The Cathedral has a rectangular shape and is oriented east-west. A view of the Cathedral from the east side is seen below. The row of columns fell towards the south-west side as a result of the great earthquake that devastated the city in 749. The prayer hall of the south-east church is divided into a nave and two aisles by two rows of columns, with eight columns in each row. On the eastern wall is an internal semi-circular apse. In the western wall, opposite the apse, there are three doorways arranged symmetrically that led from the atrium to the nave and the two aisles. 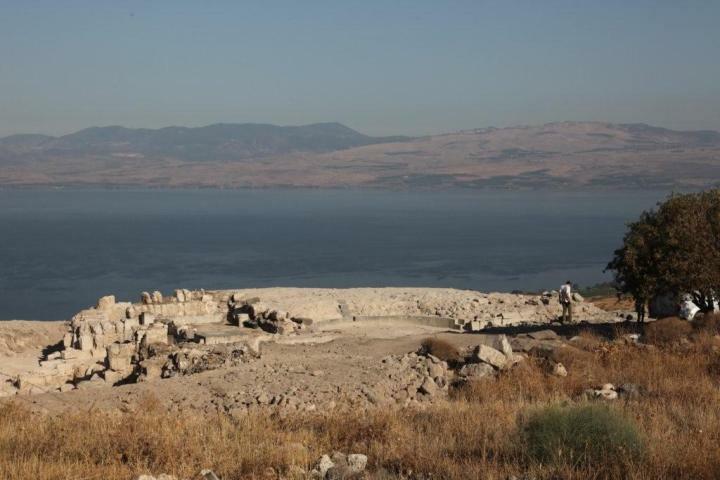 The photo below shows the view of the western side, with the south side of the Sea of Galilee in the background. On the northern side of the Church is a baptistery, which is also shaped as a rectangular hall. The hall is divided into a nave and two aisles by two rows of columns. The floor is covered by a carpet of mosaics. 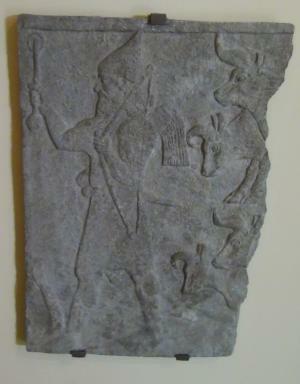 One of the inscriptions dated the floor to the end of the 6th C.
On its eastern wall are three apses, as seen below. Their walls were plastered and painted. The middle apse is the largest one; in the center of its floor is a round baptism basin (seen as a covered hole below). The water was fed to the basin via a lead pipe that was attached to the central wall above it. The south-west side opens to a great view of the southern end of the sea of Galilee. Excavations along the south-west walls reconstructed a section of the wall and a baths house. The plan of the city is seen on the right; the location of the South West walls is marked by a red marker - south of the forum. 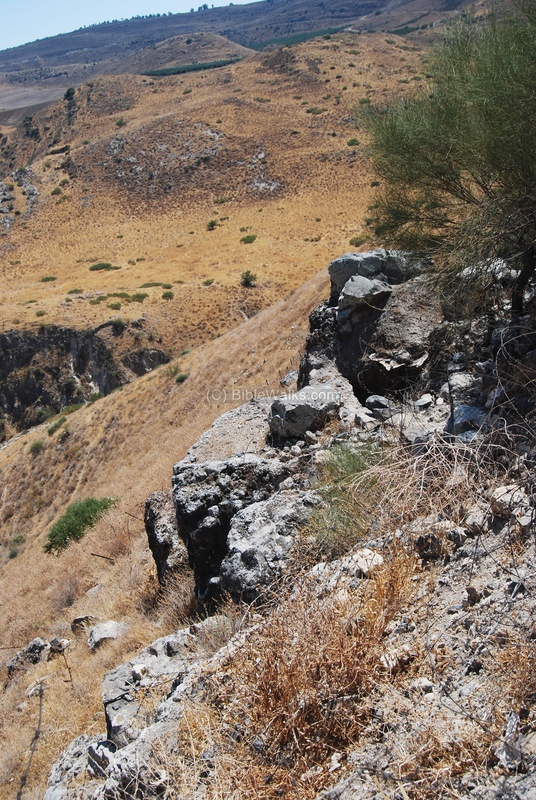 This section overlooks the modern road on the south side of the mountain (as seen below), the Sussita brook, and the southern side of the sea of Galilee. A section of the baths house is located near the walls. A closer view of the baths house is seen below, yet in the process of excavation. 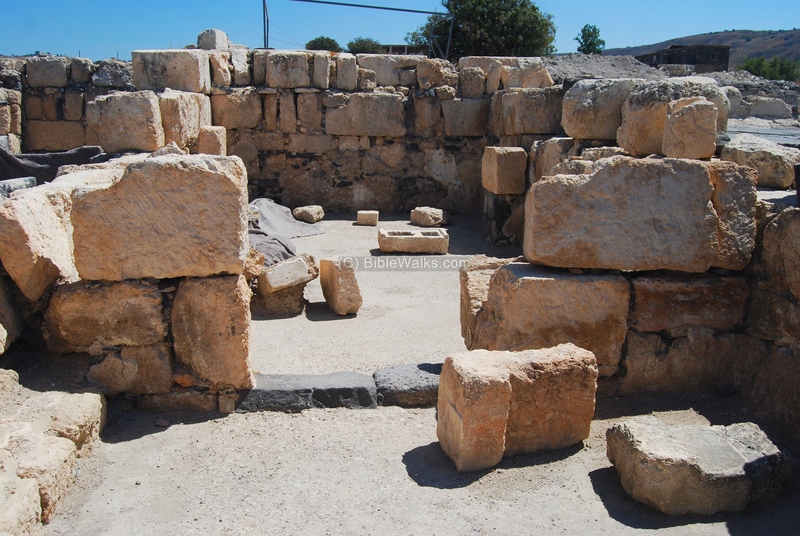 At the end of the 10th season (2009), the archaeologists finally identified the Roman public structure on the west part of the Forum that puzzled them. It was found to be an Odeon - a roofed mini-theater with about 600 seats. The structure was used for musical shows, poetry reading, poetry competitions and singing exercises. The word "Odeon" is based on the Greek word "to sing". Odeon structures were common in the Greek and Roman cities, but this was the first to be found in Israel. Another Odeon was recently found in Afek/Antipatris in the Sharon. These structures were generally small in size compared to a full-size theater, since they were used by a quality and selected audience. An aerial view of the excavations at the structure is seen below. The bush in front of the structure is on the east side. A closer view of the reconstructed structure, which is dated to the end of the 1st C AD or the beginning of the 2nd C, is seen below. It has an external rectangular shape on the east side and a semi-circular wall on the west side. The seats are arranged in the semi-circular shape, facing the stage on the east side. Most of the seats are gone, reused in other houses. In future seasons the teams will continue to reconstruct and preserve the structure. For more details - watch this exciting video. Hippos - Greek: Horse; Greek name of the city.